In a paper published in Nature today, titled “The genome of a Late Pleistocene human from a Clovis burial site in western Montana,” by Rasmussen et al, the authors conclude that the DNA of a Clovis child is ancestral to Native Americans. Said another way, this Clovis child was a descendant, along with Native people today, of the original migrants from Asia who crossed the Bering Strait. This paper, over 50 pages including supplemental material, is behind a paywall but it is very worthwhile for anyone who is specifically interested in either Native American or ancient burials. This paper is full of graphics and extremely interesting for a number of reasons. First, it marks what I hope is perhaps a spirit of cooperation between genetic research and several Native tribes. Second, it utilized new techniques to provide details about the individual and who in world populations today they most resemble. Third, it utilized full genome sequencing and the analysis is extremely thorough. Let’s talk about these findings in more detail, concentrating on information provided within the paper. The Clovis are defined as the oldest widespread complex in North America dating from about 13,000 to 12,600 calendar years before present. 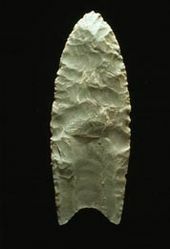 The Clovis culture is often characterized by the distinctive Clovis style projectile point. Until this paper, the origins and genetic legacy of the Clovis people have been debated. These remains were recovered from the only known Clovis site that is both archaeological and funerary, the Anzick site, on private land in western Montana. Therefore, the NAGPRA Act does not apply to these remains, but the authors of the paper were very careful to work with a number of Native American tribes in the region in the process of the scientific research. Sarah L. Anzick, a geneticist and one of the authors of the paper, is a member of the Anzick family whose land the remains were found upon. The tribes did not object to the research but have requested to rebury the bones. The bones found were those of a male infant child and were located directly below the Clovis materials and covered in red ochre. They have been dated to about 12,707-12,556 years of age and are the oldest North or South American remains to be genetically sequenced. 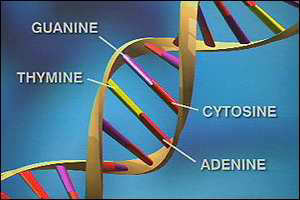 All 4 types of DNA were recovered from bone fragment shavings: mitochondrial, Y chromosome, autosomal and X chromosome. The mitochondrial haplogroup of the child was D4h3a, a rather rare Native American haplogroup. Today, subgroups exist, but this D4h3a sample has none of those mutations so has been placed at the base of the D4h3a tree branch, as shown below in a grapic from the paper. Therefore, D4h3a itself must be older than this skeleton, and they estimate the age of D4h3a to be 13,000 plus or minus 2,600 years, or older. Today D4h3a is found along the Pacific coast in both North and South America (Chile, Peru, Ecuador, Bolivia, Brazil) and has been found in ancient populations. The highest percentage of D4h3a is found at 22% of the Cayapa population in Equador. An ancient sample has been found in British Columbia, along with current members of the Metlakatla First Nation Community near Prince Rupert, BC. Much younger remains have been found in Tierra del Fuego in South America, dating from 100-400 years ago and from the Klunk Mound cemetery site in West-Central Illinois dating from 1800 years ago. It’s sister branch, D4h3b consists of only one D4h3 lineage found in Eastern China. The Y chromosome was determined to be haplogroup Q-L54. 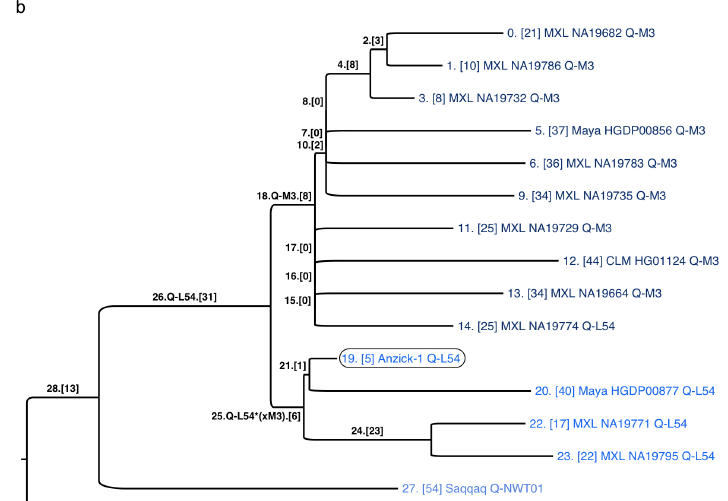 Haplogroup Q and subgroup Q-L54 originated in Asia and two Q-L54 descendants predominate in the Americas: Q-M3 which has been observed exclusively in Native-Americans and Northeastern Siberians and Q-L54. The tree researchers constructed is shown below. They estimate the divergence between haplogroups Q-L54 and Q-M3, the two major haplogroup Q Native lines, to be about 16,900 years ago, or from between 13,000 – 19,700. 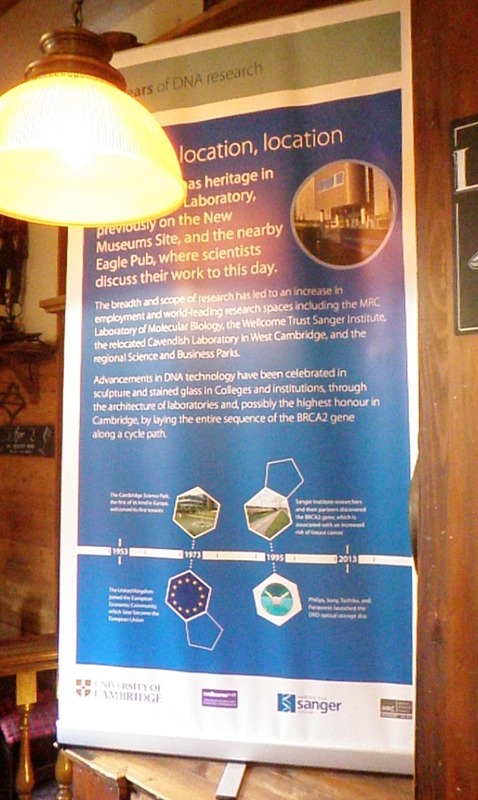 The researchers shared with us the methodology they used to determine when their most common recent ancestor (MCRA) lived. They termed their autosomal analysis “genome-wide genetic affinity.” They compared the Anzick individual with 52 Native populations for which known European and African genetic segments have been “masked,” or excluded. 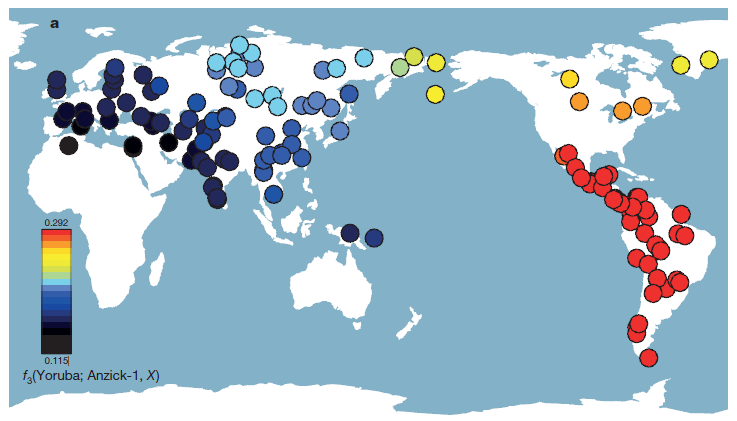 This analysis showed that the Anzick individual showed a closer affinity to all 52 Native American populations than to any extant or ancient Eurasian population using several different, and some innovative and new, analysis techniques. Surprisingly, the Anzick infant showed less shared genetic history with 7 northern Native American tribes from Canada and the Artic including 3 Northern Amerind-speaking groups. Those 7 most distant groups are: Aleutians, East Greenlanders, West Greenlanders, Chipewyan, Algonquin, Cree and Ojibwa. They were closer to 44 Native populations from Central and South America, shown on the map below by the red dots. In fact, South American populations all share a closer genetic affinity with the Anzick individual than they do with modern day North American Native American individuals. The researchers proposed three migration models that might be plausible to support these findings, and utilized different types of analysis to eliminate two of the three. The resulting analysis suggests that the split between the North and South American lines happened either before or at the time the Anzick individual lived, and the Anzick individual falls into the South American group, not the North American group. In other words, the structural split pre-dates the Anzick child. They conclude on this matter that “the North American and South American groups became isolated with little or no gene flow between the two groups following the death of the Anzick individual.” This model also implies an early divergence between these two groups. In Eurasia, genetic affinity with the Anzick individual decreases with distance from the Bering Strait. The researchers then utilized the genetic sequence of the 24,000 year old MA-1 individual from Mal’ta, Siberia, a 40,000 year old individual “Tianyuan” from China and the 4000 year old Saqqaq Palaeo-Eskimo from Greenland. Again, the Anzick child showed a closer genetic affinity to all Native groups than to either MA-1 or the Saqqaq individual. The Saqqaq individual is closest to the Greenland Inuit populations and the Siberian populations close to the Bering Strait. Compared to MA-1, Anzick is closer to both East Asian and Native American populations, while MA-1 is closer to European populations. This is consistent with earlier conclusions stating that “the Native American lineage absorbed gene flow from an East Asian lineage as well as a lineage related to the MA-1 individual.” They also found that Anzick is closer to the Native population and the East Asian population than to the Tianyuan individual who seems equally related to a geographically wide range of Eurasian populations. For additional information, you can see their charts in figure 5 in their supplementary data file. 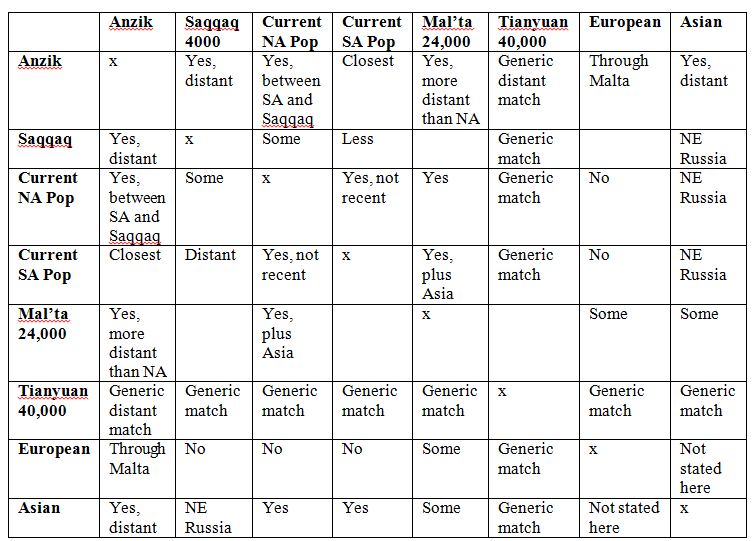 I have constructed the table below to summarize who matches who, generally speaking. In addition, a French population was compared and only showed an affiliation with the Mal’ta individual and generically, Tianyuan who matches all Eurasians at some level. The researchers concluded that the Clovis infant belonged to a meta-population from which many contemporary Native Americans are descended and is closely related to all indigenous American populations. In essence, contemporary Native Americans are “effectively direct descendants of the people who made and used Clovis tools and buried this child,” covering it with red ochre. Furthermore, the data refutes the possibility that Clovis originated via a European, Solutrean, migration to the Americas. I would certainly be interested to see this same type of analysis performed on remains from the eastern Canadian or eastern seaboard United States on the earliest burials. Pre-contact European admixture has been a hotly contested question, especially in the Hudson Bay region, for a very long time, but we have yet to see any pre-Columbus era contact burials that produce any genetic evidence of such. Additionally, the Ohio burial suggests that perhaps the mitochondrial DNA haplogroup is or was more widespread geographically in North American than is known today. A wider comparison to Native American DNA would be beneficial, were it possible. 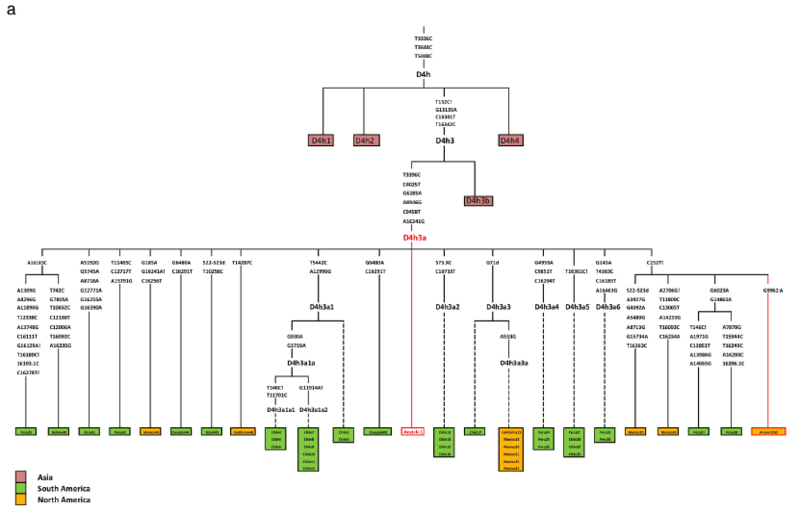 A quick look at various Native DNA and haplogroup projects at Family Tree DNA doesn’t show this haplogroup in locations outside of the ones discussed here. Haplogroup Q, of course, is ubiquitous in the Native population. National Geographic article about this revelation including photos of where the remains were found. They can make a tuft of grass look great! Another article can be found at Voice of America News. Science has a bit more. I’ve always made it a policy to reply to every e-mail or information request that I receive. The good news is that my blogs have become very popular. The bad news is that I now receive literally hundreds of e-mails every day, many asking questions or for advice, and I just can’t keep up anymore. So, I’ve assembled this information which provides direction for most of the types of inquiries I receive. First, my www.dna-explained.com blog is free, fully key word searchable and has hundreds of articles. So if you want to find out about autosomal tests, for example, just type the word “autosomal” into the search box and a list of articles about autosomal testing will appear. If you want to know which testing company to use, see Consulting and Products, below. If you have a general or specific DNA question, try searching my blog. For a long time, I’ve tried to answer basic questions for people, for free. However, recently the volume has increased to the level that I can’t do that anymore. Plus, trying to skim a question to help someone with a quick answer leads to errors and some days, I receive dozens. Hopefully, the sources above, plus the breakdown below, will answer most questions for most people. If you want to know which testing company to use, and why, the answer is “it depends,” based on your goals, who you have available to test, the products and services currently being offered by the testing companies, how thorough you want to be, and your budget. You can purchase a Quick Consult at http://www.dnaxplain.com/shop/features.aspx for a personal recommendation based on your circumstances. 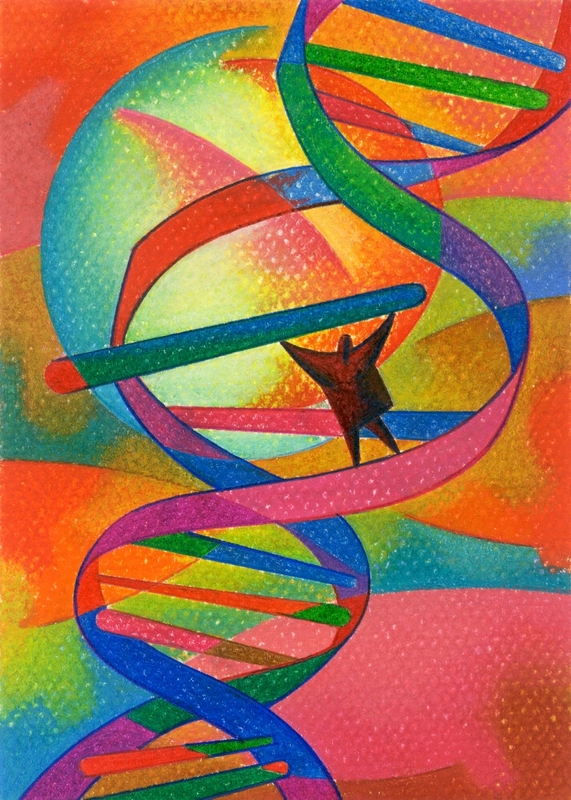 If you have questions or want to learn about your Y DNA or mitochondrial results, and have tested at Family Tree DNA, you can purchase a Personalized DNA Report at http://www.dnaxplain.com/shop/features.aspx. These are heirloom quality and range from 80-100 pages. If you are a previous client and want your report updated, I do that on an individual basis, based on what has changed. Typically updates run from $50 to $200. Contact me for specifics. If you are a previous client with questions or are looking for direction, you can purchase a quick consult at http://www.dnaxplain.com/shop/features.aspx. If you have a quick question about DNA results, you can purchase a Quick Consult at http://www.dnaxplain.com/shop/features.aspx. Quick consults are designed to answer quick and relatively simple questions that take less than an hour in total. If your question involves complex family relationships and takes more than a paragraph or so to explain, it’s will probably take more than a quick consult to unravel. In that case the quick consult would tell you what would be involved unraveling your mystery, not provide you with the answer. If you have a complex problem, contact me before purchasing a quick consult. I do not provide consulting by phone. If you have a question about who in your family to test to determine what, you can purchase a DNA Test plan available at http://www.dnaxplain.com/shop/features.aspx. If you are looking for someone to work with you through complex autosomal DNA and genealogy results, I am not accepting new clients for these types of cases, but I am referring people to a colleague. 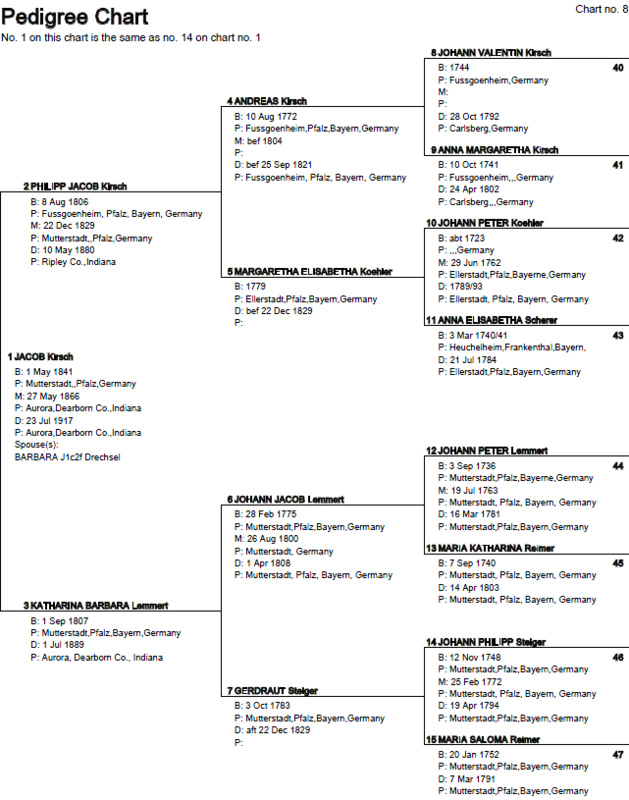 If you are looking for genealogical assistance, please visit www.apgen.org. If you are a member of one of the DNA projects for which I’m a volunteer administrator, and your question is project related, or you are inquiring about the project, I’ll do my best to help you or refer you to someone who can. Please be specific with your question and tell me which project you’re asking about. I hope you have found this information useful. Best of luck on your genetic genealogical journey! I hope you unlock the mystery of your ancestors! One of the questions I receive rather regularly is about the difference between STRs and SNPs. Generally, what people really want to understand is the difference between the products, and a basic answer is really all they want. I explain that an STR or Short Tandem Repeat is a different kind of a mutation than a SNP or a Single Nucleotide Polymorphism. STRs are useful genealogically, to determine to whom you match within a recent timeframe, of say, the past 500 years or so, and SNPs define haplogroups which reach much further back in time. Furthermore SNPs are considered “once in a lifetime,” or maybe better stated, “once in the lifetime of mankind” type of events, known as a UEP, Unique Event Polymorphism, where STRs happen “all the time,” in every haplogroup. 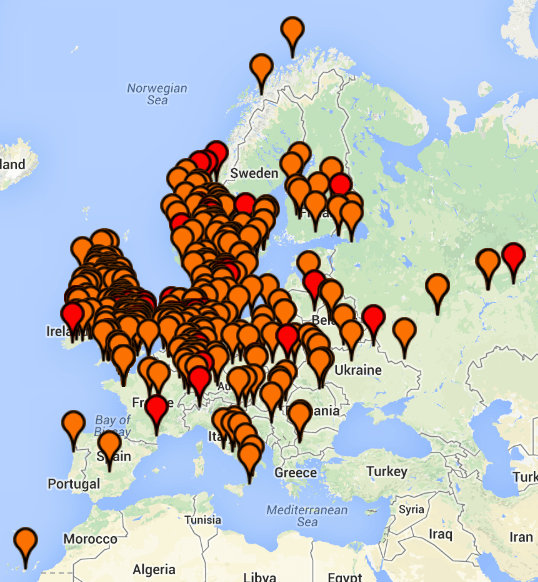 In fact, this is why you can check for the same STR markers in every haplogroup – those markers we all know and love. This was a pretty good explanation for a long time but as sequencing technology has improved and new tests have become available, such as the Full Y and Big Y tests, new mutations are being very rapidly discovered which blurs the line between the timeframes that had been used to separate these types of tests. 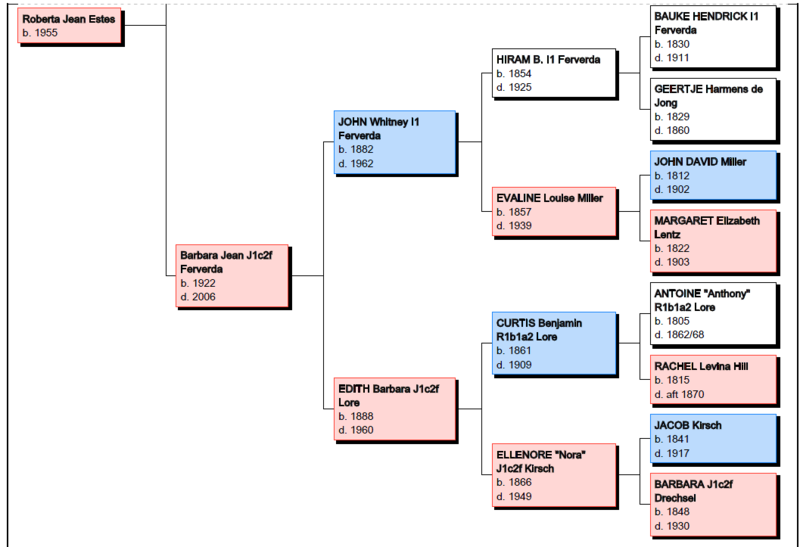 In fact, now they are overlapping in time, so SNPs are, in some cases becoming genealogically useful. This also means that these newly discovered family SNPs are relatively new, meaning they only occurred between the current generation and 1000 years ago, so we should not expect to find huge numbers of these newly developed mutations in the population. For example, if the SNP that defined haplogroup R1b1a2, M269, occurred 15,000 years ago in one man, his descendants have had 15,000 years to procreate and pass his M269 on down the line(s), something they have done very successfully since about half of Europe is either M269 or a subclade. Each subclade has a SNP all its own. In fact, each subclade is defined by a specific SNP that forms its own branch of the human Y haplotree. But what does a SNP or an STR really look like, I mean, in the raw data? How do you know that you’re seeing one or the other? These nucleotides combine in pairs to form the ladder rungs of DNA, shown right that connect the helix backbones. T typically combines with A and C usually combines with G, reaching between the backbones of the double helix to connect with their companion protein in the center. You don’t need to remember the words or even the letters, just remember that we are looking for pattern matches of segments of DNA. A deletion would be noticed if the leading A were simply gone. An addition of course would be if a new bead were inserted in the sequence at that location. All of the above changes involve only one location. These are all known as Point Mutations, because they occur at one single point. A point mutation may or may not be a SNP. A SNP is defined by geneticists as a point mutation that is found in more than 1% of the population. This should tell you right away that when we say “we’ve discovered a new SNP,” we’re really mis-applying that term, because until we determine that the frequency which it is found in the population is over the 1% threshold, it really isn’t a SNP, but is still considered a point mutation or binary polymorphism. Today, when SNPS, or point mutations are discovered, they are considered “private mutations” or “family mutations.” There has been consternation for some time about how to handle these types of situations. ISOGG has set forth their criteria on their website. They currently have the most comprehensive tree, but they certainly have their work cut out for them with the incoming tsunami of new SNPS that will be discovered utilizing these next generation tests, hundreds of which are currently in process. A STR, or Short Tandem Repeat is analogous to a genetic stutter, or the copy machine getting stuck. In the same situation as above, utilizing the same base for comparison, we see a group of inserted nucleotides that are all duplicates of each other. In this case, we have a short tandem repeat that is 4 segments in length meaning that CT is inserted 4 times. To translate, if this is marker DYS marker 390, you have a value of 5, meaning 5 repeats of CT. So I’ve been fat and happy with this now for years, well over a decade. To the best of my knowledge, this is impossible – one type of mutation excludes the other. I googled about this topic and found nothing, nor did I find additional discussion of L69, other than this. My first reaction to this was “that’s impossible,” followed by “Bloody Hell,” and my next reaction was to find someone who knew. Whew! I must say, I’m relieved. I thought there for a minute there I had lost my mind. Now, that I understand. I have children, and grandchildren – I fully understand multiple things happening at once. Let’s break this example apart and take a look at what is really happening. HUGO is a reference standard, so let’s start there as our basis for comparison. In the L69 variant we have the following sequence. We see two distinct things happening in this sequence. First, we have the deletion of two Gs, and secondly, we have the insertion of one additional TG. 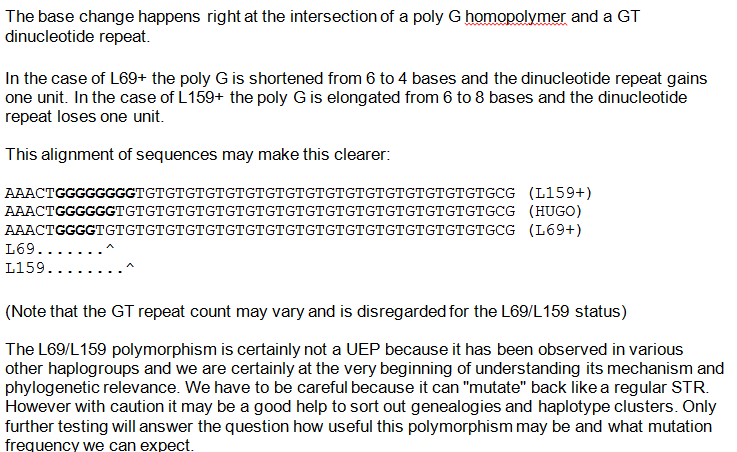 According to Dr. Mittelman, both of these events are STRs, multiple insertions or deletions, and neither are point mutations or SNPs, so neither of these should really have SNP names, they should have STR type of names. Let’s look at the L159 variant. In this case, we have the GG insertion and then we have a TG deletion. In both cases, L69 and L159, the actual length of the DNA sequence remains the same as the reference, but the contents are different. Both had 2 nucleotides removed and 2 added. The good news is, as a consumer, that you don’t really need to know this, not at this level. 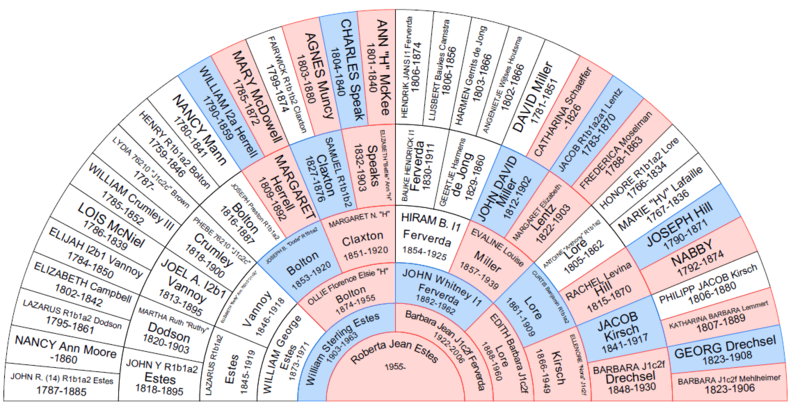 The even better news is that with the new discoveries forthcoming, whether they be STRs or SNPs, at the leafy end of the branch, they are often now overlapping with SNPs becoming much more genealogically useful. In the past, if you were looking at a genetics mutation timeline, you had STRs that covered current to 1000 years, then nothing, then beginning at 5,000 or 10,000 years, you have SNPs that were haplogroup defining. That gap has been steadily shrinking, and today, there often is no gap, the chasm is gone, and we’re discovering freshly hatched recently-occurring SNPs on a daily basis. 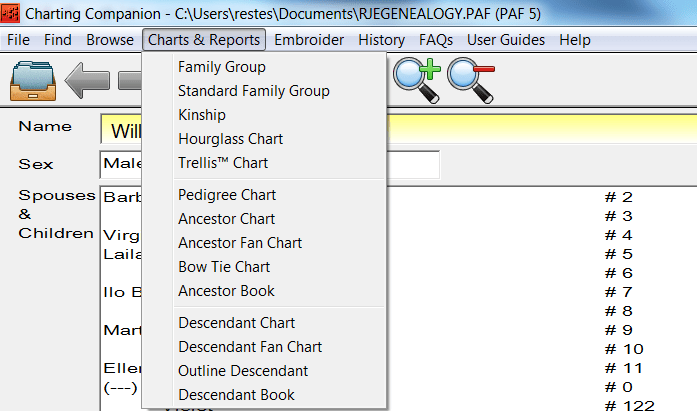 The day is fast approaching when you’ll want the full Y sequence, not to further define your haplogroup, but to further delineate your genealogy lines. You’ll have two tools to do that, SNPs and STRs both, not just one. I want to thank Dr. Mittelman for his generous assistance with this article. 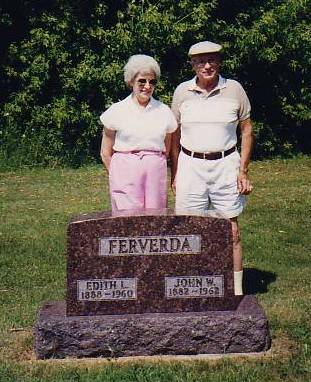 My grandfather’s name was John Whitney Ferverda. I’ve always wondered about that middle name, with no idea where it came from. It does not appear to be a family name. He was born on December 26, 1882 in Plain Township, Kosciusco County, Indiana, on a farm to Hiram B. (probably Bauke) Ferverda and Evaline Louise Miller Ferverda. 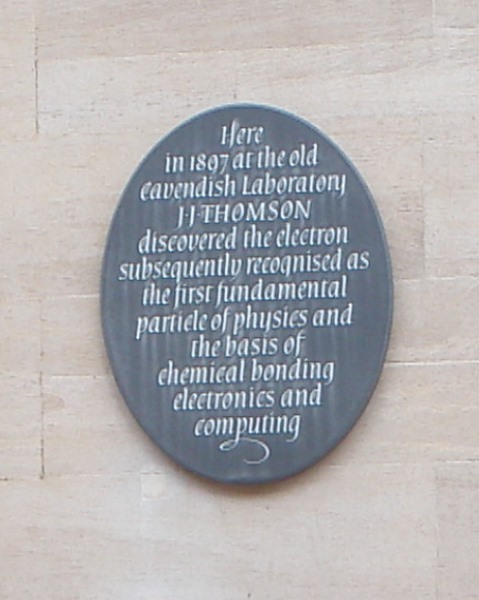 He died on June 9th 1962. I was 7 and I remember him, albeit somewhat vaguely. His wife. Edith Barbara Lore Ferverda who he had married in Rushville, Indiana in 1908 had just died 18 months before, so it had been a rough couple years in the family. With John Ferverda’s death, the homeplace had to be sold, the furniture divided, and all of those things that signal the end of an era and what we’ve come to know as closure needed to be done. 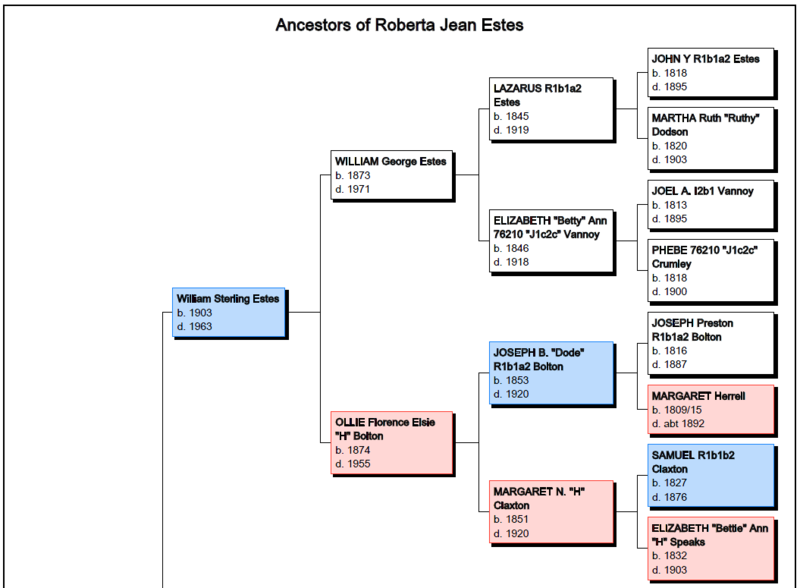 John and Edith had two children, my mother, Barbara, and one son, Harold Lore Ferverda, known by the family as Lore. I think I’ll let Mom introduce you to her father, in her own words. I gave my Mother a book called “Grandmother’s Memories” to complete for her grandchildren and great-grandchildren. She did, at first in her own hand, and then later, as her handwriting became more difficult to read, she would tell me the answers and I would write them for her. The book asked questions or gave topic suggestions. My Father’s name was John Whitley Ferverda. He was born in 1882 and died in 1962. He had blue eyes. When I was so sick with rheumatic fever, every morning he carried me downstairs to the davenport and every evening upstairs to bed. He always had time to read to me. I was too sick to read for myself. I was 7 or 8 and he read everything to me I could get my hands on. He worked at the Ford Agency in Silver Lake selling cars and trucks. When I went to school, we walked and went the next half block further to the Ford Agency and asked Dad for a nickel. When he gave it to me, I promptly went to the drug store and bought a Hershey bar, which Dad knew I’d do. He was one of 11 children. From their farm they walked over to Tippecanoe Lake to swim which was about a mile. He took enough schooling to be a teacher, but never secured a position with the school. Instead he started with the railroad and was sent to Rushville where he met Mother. 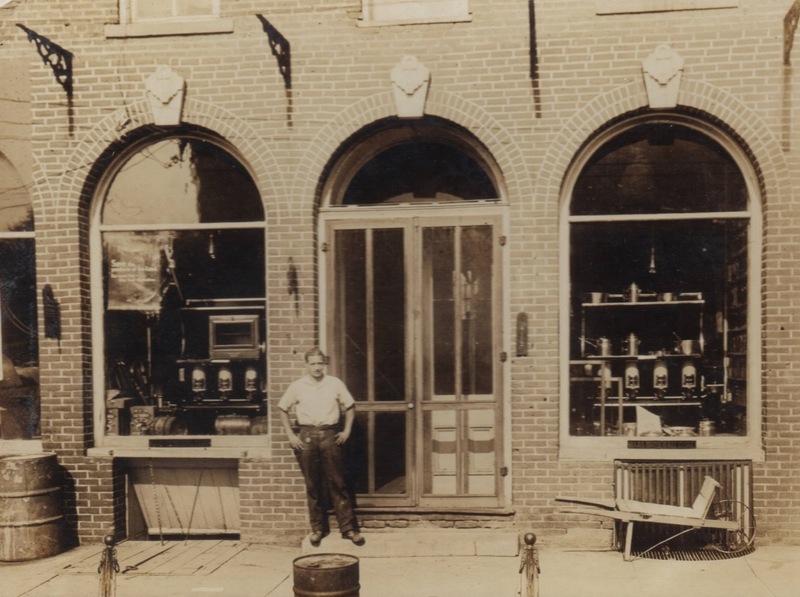 John Ferverda is a merchant of successful experience and has been identified with the hardware trade at Silver Lake for a number of years, being one of the live and enterprising business men and citizens of that locality. He was born in Plain Township of this county Dec. 26, 1882, a son of Hiram B. and Eveline Miller Ferverda, both of whom now reside at Leesburg. John Ferverda grew up on his father’s farm in Plain Township and was liberally educated. He attended both the common and high schools of Oswego, being a graduate of both, and also was a student in the Tri-State Normal at Angola. For his scholarship he was granted a license to teach, but never used it in that profession. His life was spent largely at home until the age of 22. Having mastered the art of telegraphy, he entered the service of the Big Four Railway as an operator, and was assigned at different stations along that system and remained in that service about 10 years. 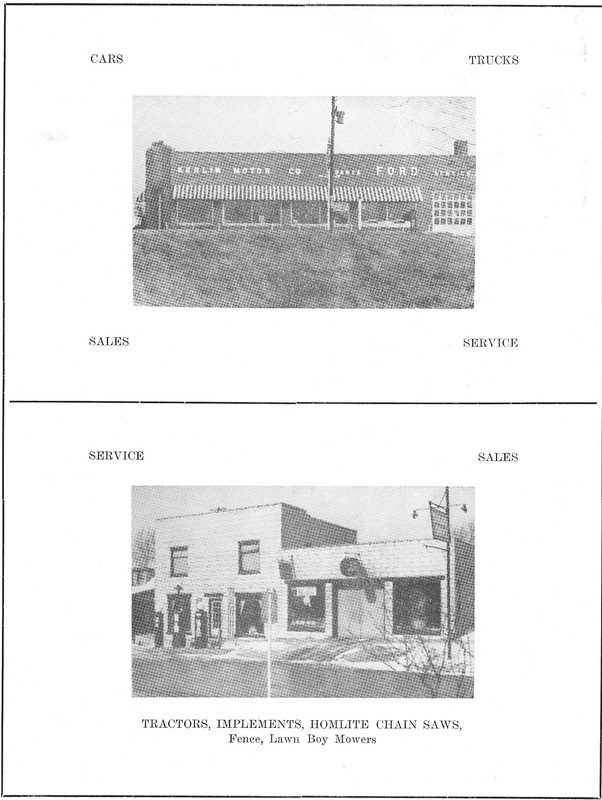 In 1916, Mr. Ferverda left the railroad to take up business and is now a member of the F. and F. Hardware Company of Silver Lake. John is shown in front of his hardware store, below. In 1907 he married Miss Edith B. Lore, a native of Rush Co., Indiana and a high school graduate. They have one son, Harold L., born November 24, 1915. Mr. and Mrs. Ferverda are members of the Lutheran Church and he is affiliated with the Denning Lodge No 88, Ancient Free and Accepted Masons, at North Manchester, and of the Knights of Pythias Lodge. In politics, he is a republican. Was he ever a Republican. I remember Mom talking about her father quizzing potential suitors. The first question he would ask them is whether or not they were Republican. Mom said she knew better than to bring home a Democrat!!! For years Mom had a small ivory elephant watch charm about an inch long that was his that I suspect was meant as the symbol of the Republican Party. At some point, before his marriage, probably while in college, John was in some sort of a play. He is the front row, bottom left corner. 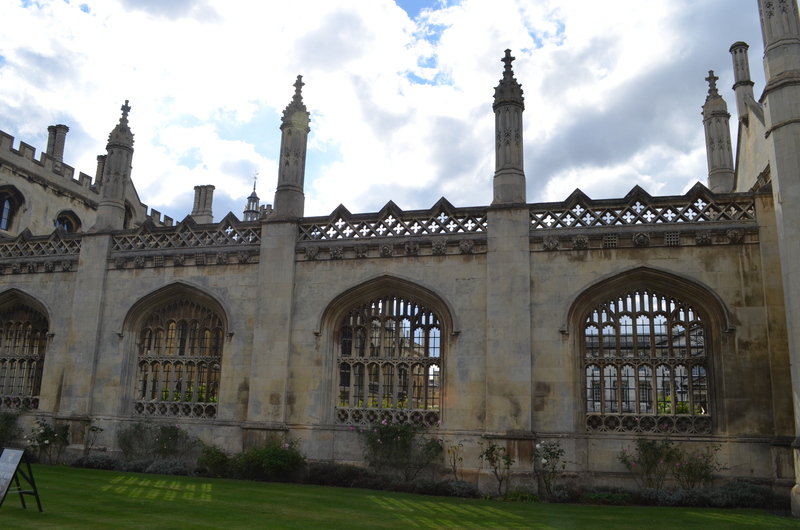 John studied to be a teacher, but for some reason, after graduating, never pursued that avenue. Instead, he joined the railroad as a telegraph operator and station master. He was assigned to Rushville, Indiana. We don’t know exactly when he went to Rushville, but in an article in the Rushville paper, dated January 25, 1907, John was a pallbearer for Miss Maude Foust who died of typhoid. We also know he sang tenor in a quartet at the Presbyterian Church in Rushville, based on a November 1908 news report . 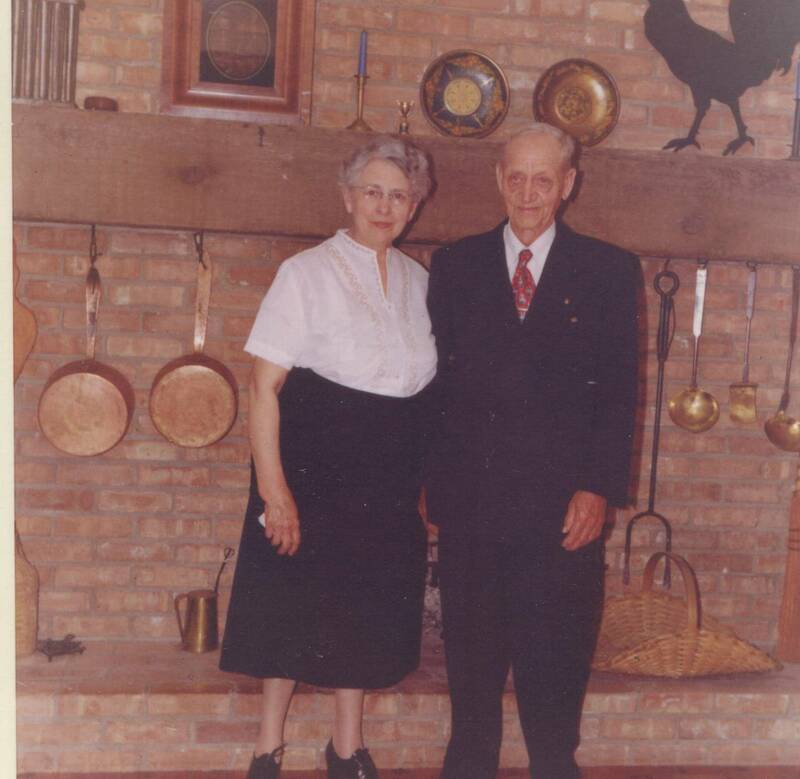 While in Rushville, John met and married Edith Barbara Lore, daughter of Curtis Benjamin, known as CB, Lore and Ellenore “Nora” Kirsch Lore. She too attended the Presbyterian Church. Rushville Republican Newspaper, Jan. 3, 1910 – John Ferveda who was recently transferred to cashier at the local office has been given the agency at Silver Lake in the northern part of the state and will leave here in the next few weeks. 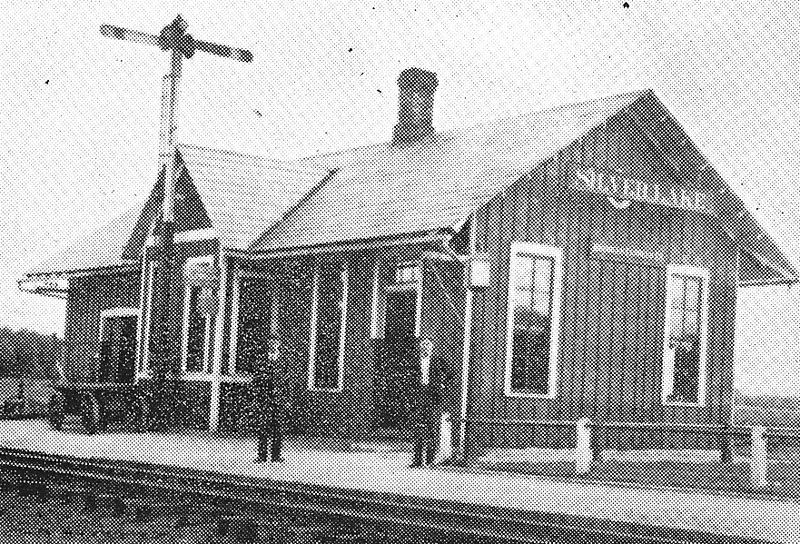 John and Edith moved back to Silver Lake where John served as the station master and where they spent the rest of their lives. 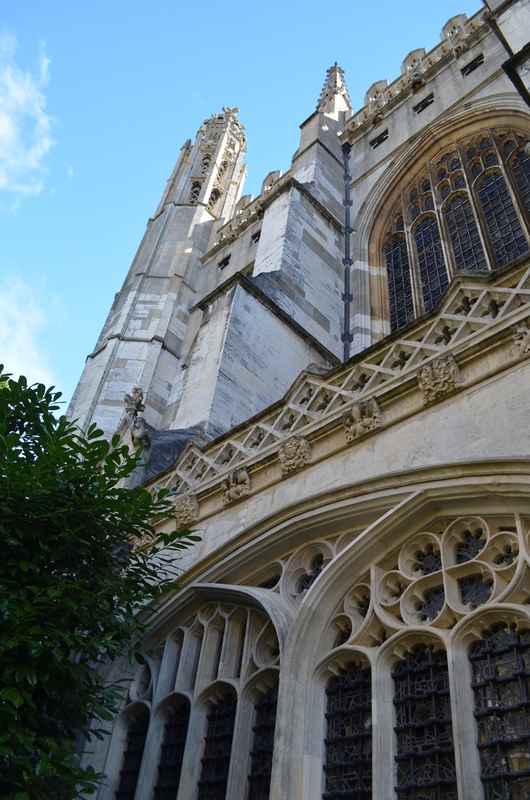 While their immediate family was small, John had many siblings in the area. He was one of 11 children born to Hiram and Eva Ferverda. One of his siblings, Roscoe, lived across the street from him in Silver Lake, Indiana. 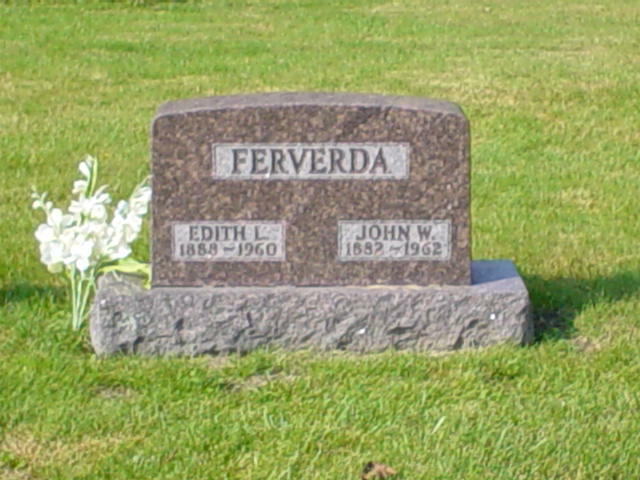 John Ferverda’s parents were Brethren, although it appears that not all of the family continued in that faith which prohibited military service, among other things. 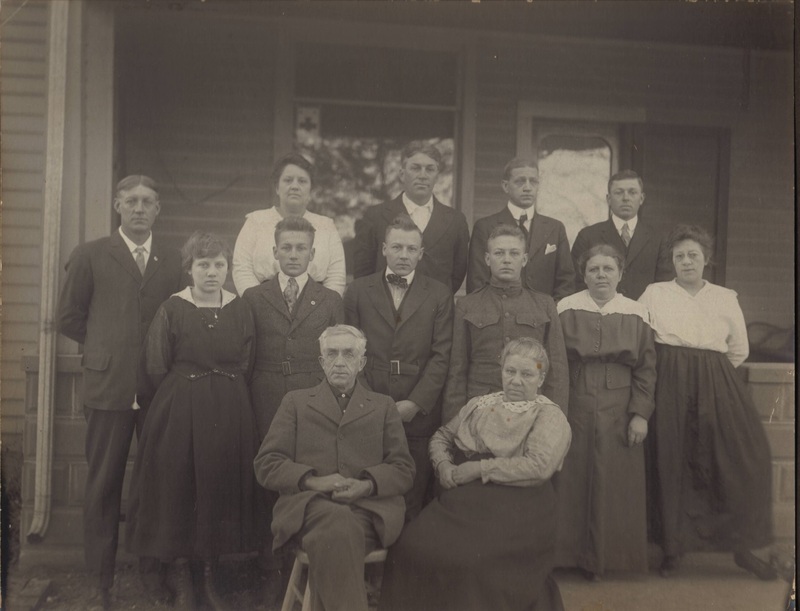 John broke with the Brethren faith by marrying Edith who was a Lutheran, and Roscoe broke with the Brethren faith by serving in WWI. In fact, four of John and Eva’s sons, in total, served in the military, Ira in the Spanish American War and then Donald, Roscoe and George. Those three sons are standing together in the middle row, with George, on the right, in uniform. John and Roscoe were close their entire lives, even though there was 9 years between them, Roscoe having been born in 1893. In fact, when Roscoe returned from military service, he too worked at the station with his brother for the railroad until the depot in Silver Lake closed in 1958 due to declining business. 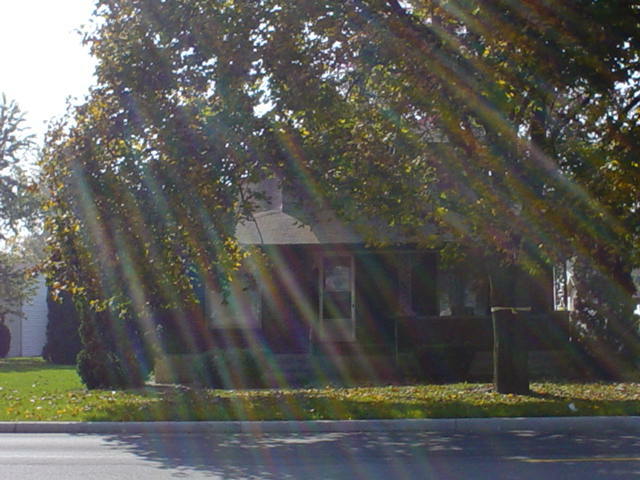 John and Edith bought a house in Silver Lake that was located right by the railroad tracks, which were across the field to the right of their house in the photo below. I loved the large screened-in front porch on this house. The screens were painted yearly to keep them from rusting, and rocking chairs resided on the porch in warm weather. One time, Lore was painting the screens and my mother was bothering him in her sisterly way. He decided to paint her cat’s nose, which infuriated my mother, so he then painted mother’s nose black too….except he “missed” and got her entire face with the side of the large brush he was using. Mother was scheduled to perform in a dance recital later that day on the courthouse square in Wabash. I’m sure you can imagine the drama and hullaballoo that results from that little incident. Paint then was not water soluable and required turpentine and scrubbing to remove. This was always one of mother’s favorite stories about her brother. Roscoe bought the house right across the street. Roscoe and John were thick as thieves. Old newspapers can be a lot of fun. In the local paper I found some tidbits that give us hints about John’s life. Donald Ferverda is visiting with his brother John Ferverda and wife at Silver Lake. Don was one of the three Ferverda sons who served in the military in WWI. After returning, he was a cashier at the bank in Leesburg and died relatively young of cancer. Mr. and Mrs. John Ferverda of Silver Lake visited with Hiram Ferverda and family over Sunday. Visiting your parents hardly seems like a newsworthy event. It wasn’t far from Leesburg to Silver Lake – about 18 miles. However, it’s a lovely tidbit. 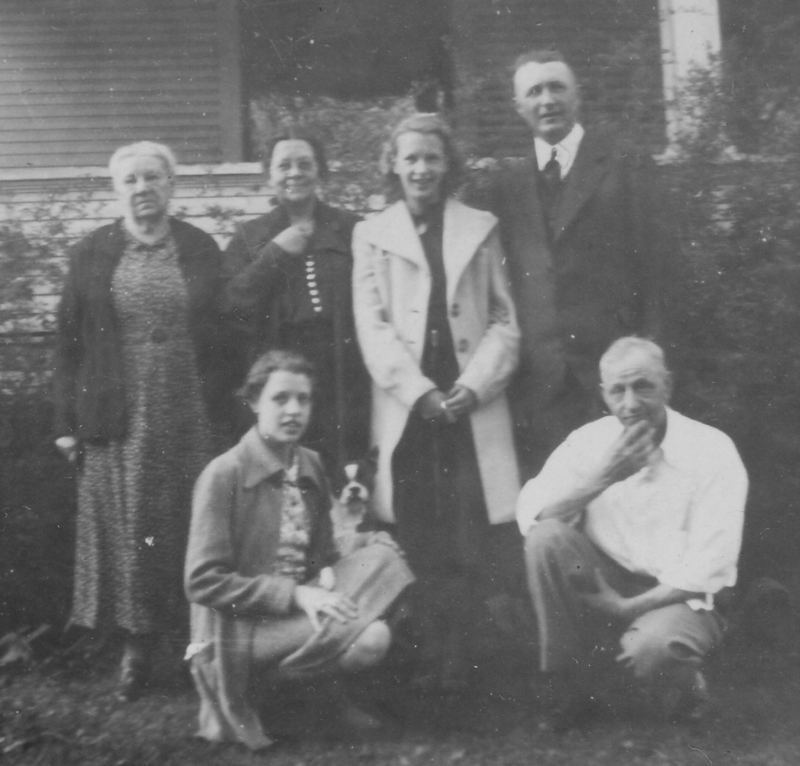 Mrs. Gertrude (her name was Nora, not Gertrude) Lore of Rushville is here at present visiting with her daughter, Mrs. John Ferverda and husband. Mrs. Lore’s two daughters (Mildred, 13, and Eloise, 9) have been here for the past several weeks visiting at the Ferverda home. The garage building is nearing completion. The metal ceiling is completed and is now ready for the paint. The building will be ready for occupancy within a short time. 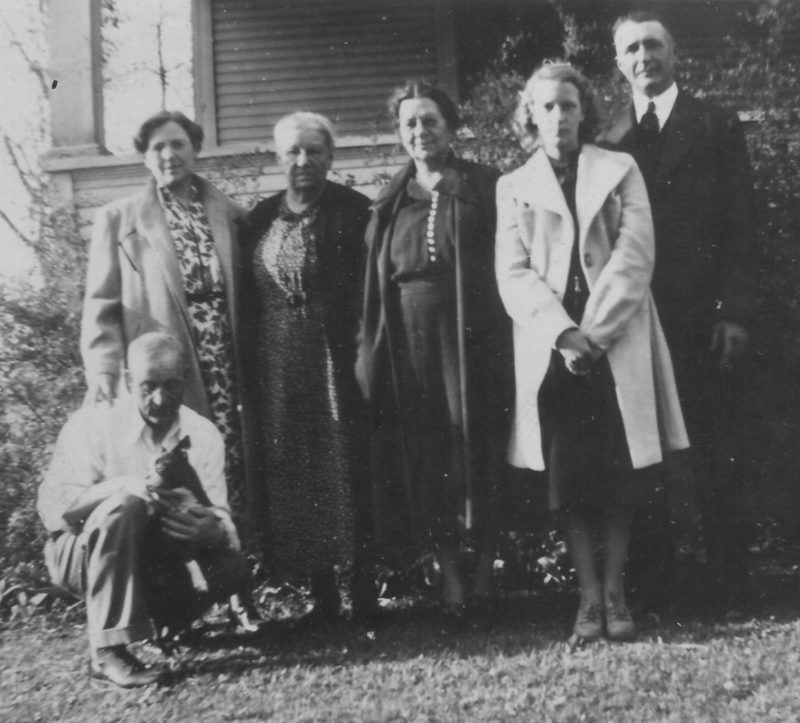 Mr. and Mrs. John Ferverda of Silver Lake are here for a two weeks visit with his parents, Mr. and Mrs. H.B. Ferverda. H. L. Anderson of Westport who had been here as a relief agent for Mr. Ferverda during his absence went to Leesburg yesterday where he will be for 15 days while the Leesburg agent takes a trip. Agent here refers to railway agent. Paul Ferverda of Leesburg is here visiting with his brother, John Ferverda and wife. John had brothers Ira, Irvin, Ray, George and Donald who lived outside of Silver Lake, but no Paul. Roscoe lived in Silver Lake across the street from John. We understand that Ray Ferree who recently was bumped off of the Big Four at North Manchester by one who was older in the service will apply for the station here and if he applies it will almost be sure that the company will award him the position. The family will then move here and occupy the Mrs. Metzger property near the depot and Mr. Ferverda, the agent, who resides there at present will go to Markleville. The family never went to Markleville. H.P. Rager, John Ferverda and Dale Homman were down to North Manchester last evening taking the first steps in the degree work of the Masonic order. Ray Feree is here this week as relief agent for John Ferverda at the Big Four. Mr. Ferverda is taking a vacation and will also have his eye operated on upon during his vacation. He went to Cincinnati the first of the week for that purpose. This is a week before John Ferverda’s son, Lore was born, on November 24th. I wonder what kind of eye surgery he had performed, and for what condition. John Ferverda, our genial agent at the Big Four station and wife and Percy Helser the drayman, and wife, are the proudest people in the whole community and passed the most enjoyable Thanksgiving of any. The stork came to their homes Wednesday afternoon and left a bouncing boy baby at the Ferverda home and at the Helser home he left a sweet little girl. 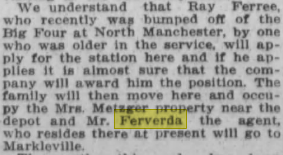 Rushville Republican Newspaper, Jan. 8, 1916 – J. W. Ferverda, Big Four agent at Silver Lake and well known here has purchased a hardware store there in partnership with R. M. Frye. He has resigned his position with the railroad company. J. W. Ferverda has returned home from a trip to Rushville where he was for a couple of days visiting with his wife and son. John Ferverda is going about bandaged up on account of a broken rib received a few days ago when he was assisting in unloading some machinery. In 1918, every man had to register for the draft. WWI was upon us. John Whitney Ferverda registered, said that his occupation was in retail hardware and as an implement merchant. He was described as short, of medium build with light hair and gray eyes. I never knew he had grey eyes. 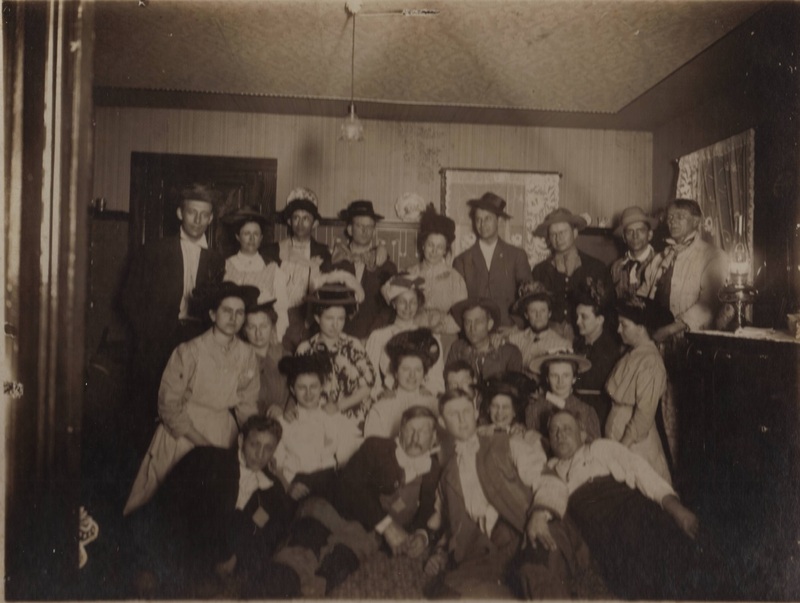 Friends and relatives here had just learned of the marriage last month of Roscoe Ferverda, son of Mr. and Mrs. H. B. Ferverda of Leesburg and Miss Effie Ringo of North Vernon, Indiana. 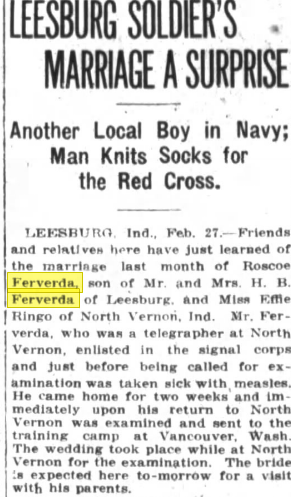 Mr. Ferverda who was a telegrapher at North Vernon enlisted in the signal corps and just before being called for examination was taken sick with measles. He came home for two weeks and immediately upon his return to North Vernon was examined and sent to the training camp at Vancouver, Washington. 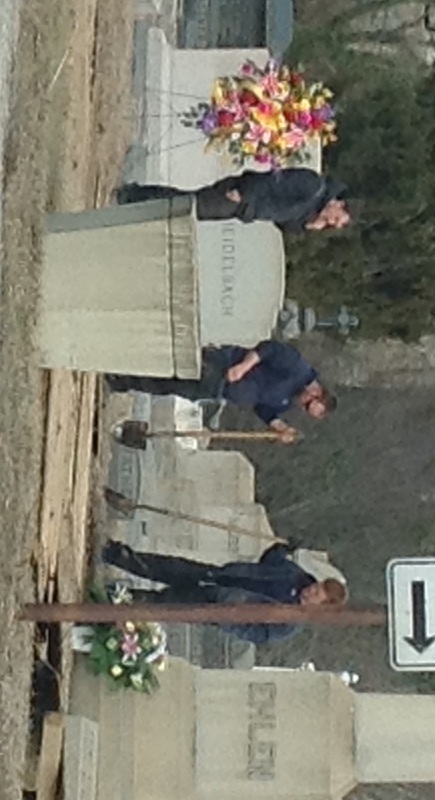 The wedding took place while at North Vernon for the examination. The bride is expected here tomorrow for a visit with his parents. So it seems that not only did Roscoe join the military, he married a non-Brethren wife as well, without telling his parents. Those Ferverda boys, renegades all of them…. In the 1930 census, we know that Roscoe is an agent for the Big 4 Railroad, almost the last person enumerated in the village of Silver Lake, in Lake Township, in Kosciusko County, Indiana. 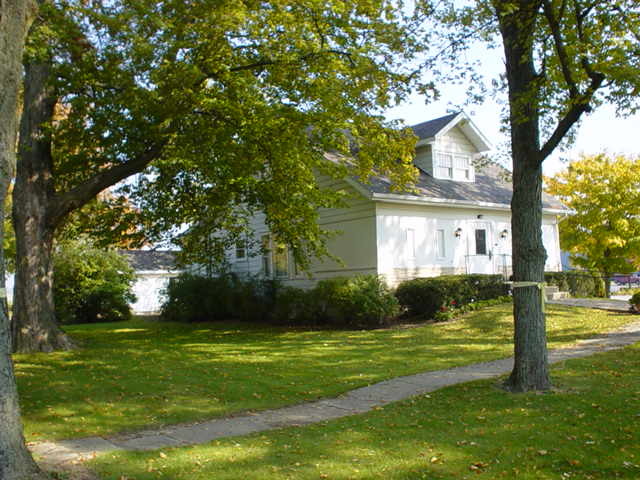 John Ferverda was the first household enumerated, living directly across the street from Roscoe. In 1930, John was a salesman at the Ford garage. With the decrease of rail shipping, jobs with the railroad evaporated. Below, both the new and old garages in Silver Lake. At some point, and I believe it was before or during the Depression, John Ferverda owned a hardware store in downtown Silver Lake. The problem was that people couldn’t pay their bills. Eventually, that business would close, and John would raise chickens in the chicken house behind the house and sell eggs. There may have been a Depression, but everyone still had to eat. Eggs and chicken were relatively cheap protein and both eggs and hatchlings were shipped as far as New York. John loved his chickens, and this one was his favorite and according to the back of the picture, his best producer. Mother remembers cleaning chickens as a child during the Depression, and not fondly, I might add. 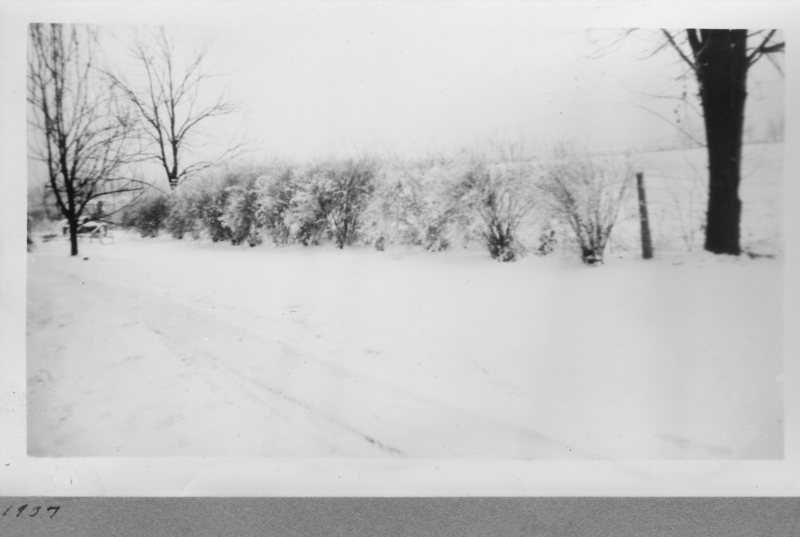 Sometime, about this same time, when Lore was a late teen, it seems that he “borrowed” the family car without permission, and managed to get it stuck in the snow. I don’t know how he managed to get ahold of his father, but he did. 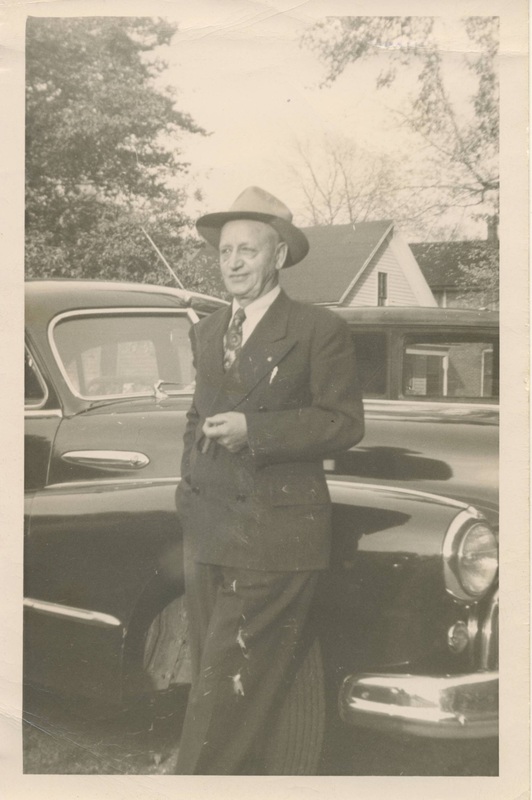 If he thinks he was in trouble with his Dad, he hadn’t seen anything yet because his mother, Edith, relied on that car to get her to the job that supported the family during the Depression. So off John and Lore set to get Lore unstuck. I’m not sure who went with them, but I’m guessing it was Roscoe. The photo above is labeled 1937 in Mom’s photo album. There is another photo also of a sleigh with a horse pulling it that looks to be about the same time. Two houses down the street was the Methodist Church where the Ferverdas were members. 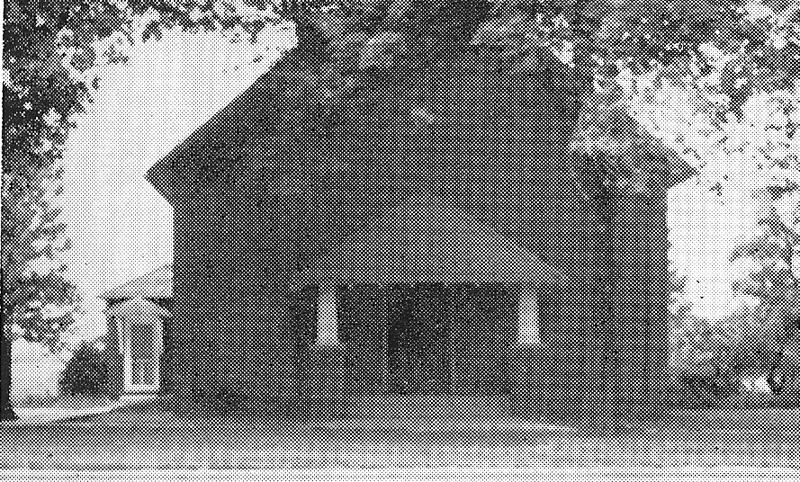 I have vivid memories of this church when I was little, sitting on the small child sized chairs and belting out Jesus Loves Me at the top of my lungs in Sunday School, which was through the side door on the left and downstairs. I can still hear it…. On the 1940 census, Roscoe and John are shown with 4 residences between them. Roscoe is still an agent for the railroad and now John is an “owner and overseer” on a chicken and fruit farm. I had entirely forgotten about the apple orchard and the raspberries. The entire “back yard” was apple trees and behind the orchard, the property terminated in a huge mass of brambles which they called raspberries. All I know is that I avoided that area because no matter what I did, they always stuck me, one way or another. I can’t imagine how they picked those berries, but obviously they did. My grandparents had a back porch with a hand pump where they washed and processed the apples. That same pump pumped the water for the kitchen and bathroom, both of which were adjacent to the pump room. This WAS considered running water at that time. In 1941, John Whitney Ferverda registered for the WWII draft, even though he was 59 years of age. His signature is beautiful. 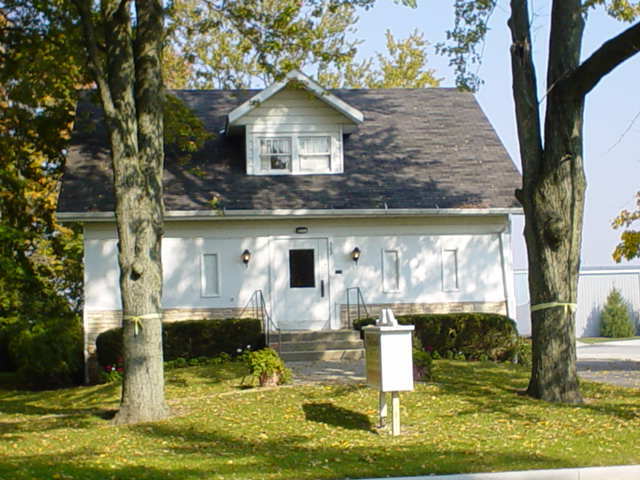 Silver Lake, where they lived was a small town, but it was not incorporated, so they were part of Lake Township, although Silver Lake made up the most populous part of that township. 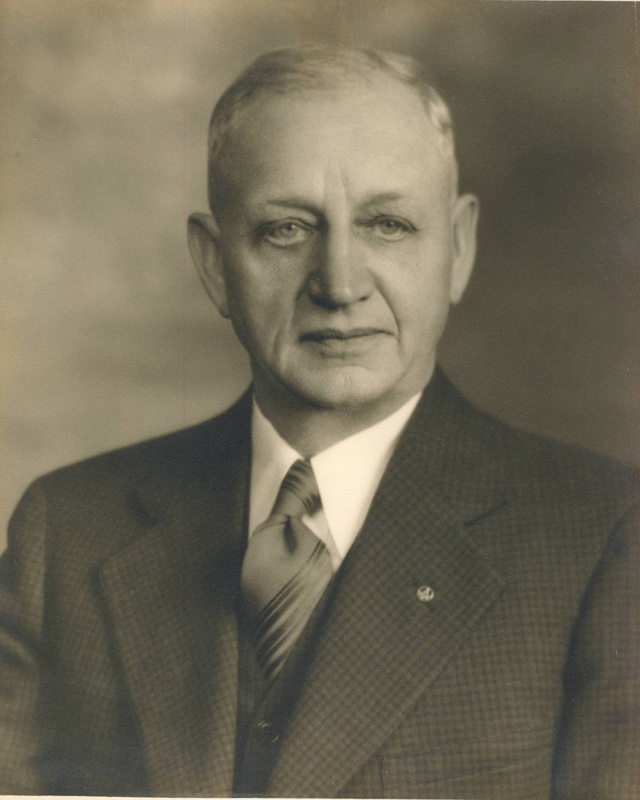 From 1943-1950, John Ferverda was township Trustee. 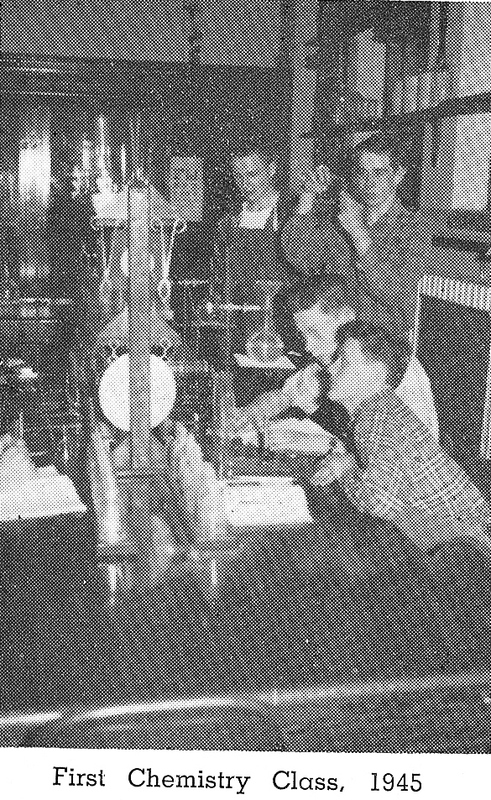 In 1945, the newspaper reported that , “Trustee John Ferverda provided a fully equipped chemistry lab and the course in chemistry was added in the high school.” John’s son, Lore Ferverda, had graduated from Silver Lake High School in the class of 1933 and went on to become a chemist, eventually holding several patents. I do believe this was before recliners had been invented. I remember my grandmother starching those chair arm and back covers. My grandfather did this every afternoon. I think I inherited the propensity from him! Must be genetic. Speaking of genetics, we have been fortunate that one of Roscoe’s sons volunteered to take the Y-line DNA test as well at the autosomal test. Roscoe’s daughter, Cheryl, has taken the autosomal test as well. In fact, these folks were some of the first testers at 23andMe and are now participating in projects at Family Tree DNA. There is a Ferverda DNA project, but needless to say, with a name like that, it’s not very large. 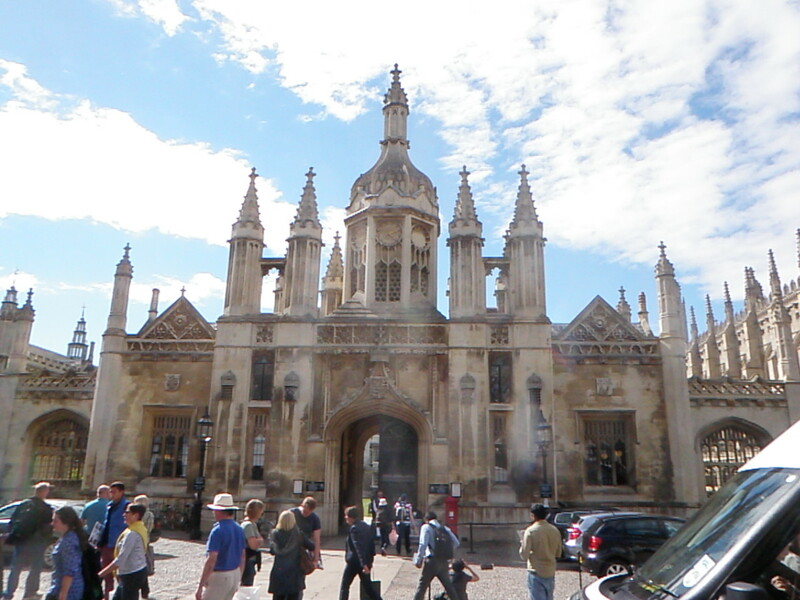 Cheryl, and I are in the final stages of planning a trip back to the Ferverda homeland in 2014. We can hardly wait and I’ll be sharing that with you too, but for now, back to John Ferverda. 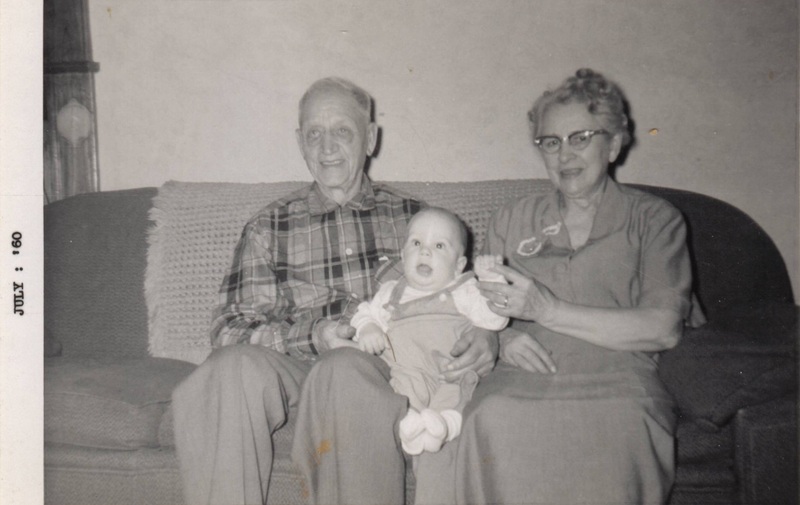 John and Edith Ferverda with their first great-grandchild, Bruce, born on the 4th of July, 1959. 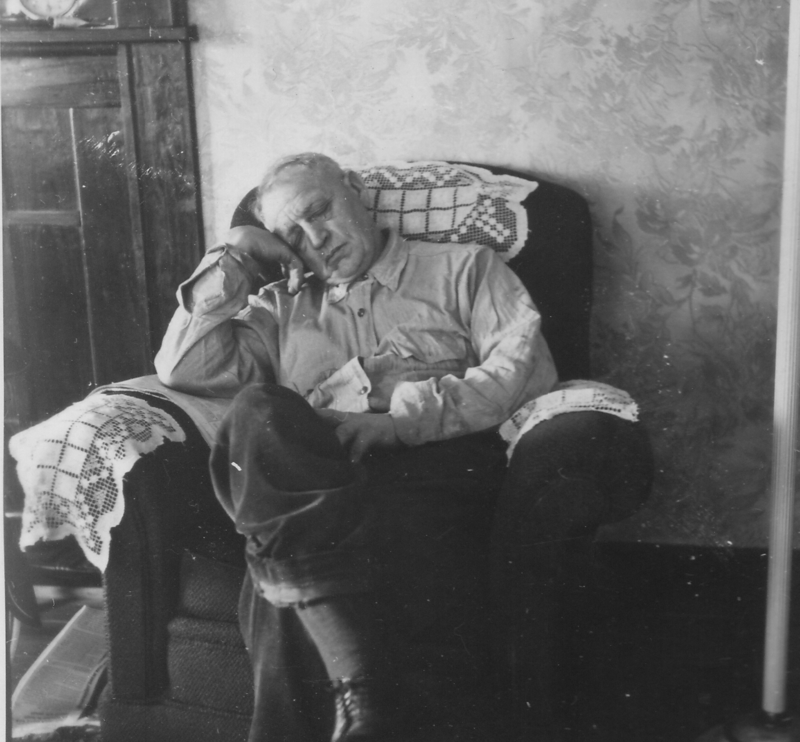 The family referred to him as “the firecracker with a short fuse.” I believe this photo was taken at Christmas, 1959. Edith passed away, a few days later, in January of 1960. I don’t know where this photo was taken, but it wasn’t their house. This is a great photo and is exactly how I remember Edith Lore and John Whitney Ferverda. By the late 1950s or early 1960s, John had tuberculosis. They believed it had been dormant for decades. Edith’s father and sister both died of TB in 1909 and 1912, respectively. He went to the tuberculosis sanitarium where he was treated for several months. After returning home, he became ill again in 1962, except this time it was inoperable liver and pancreatic cancer. He passed away on June 9, 1962. This photo is of Edith and John’s two children at their gravesite. Stopping at the cemetery became a regular occurrence anytime we were in that vicinity, or could be without a huge detour. Since neither of their children lived in Silver Lake, after John passed away, they put the house with the chicken houses and apple trees and raspberry bushes up for sale. I remember Mom talking about how difficult it was to go through their things. I also remember finding money hidden in the most unusual places. I suspect that was a relic of the Depression years when life was extremely difficult. One time, I picked up a powder box and a false bottom fell out, along with some cash hidden there. I wonder how much was inadvertently given away, secreted away like that. 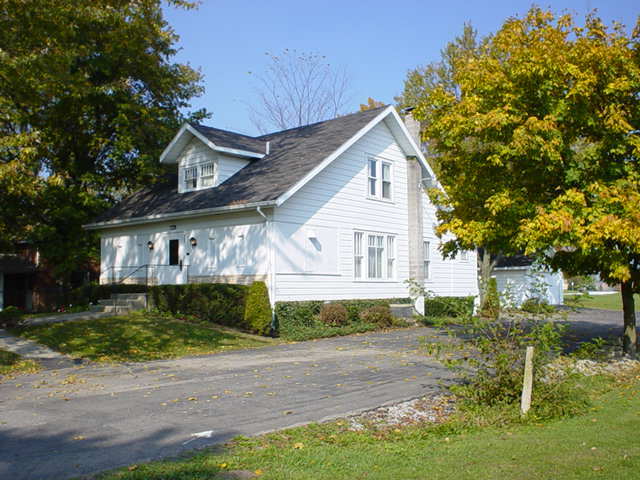 Mom and Uncle Lore sold the property, and the new owners turned it into a funeral home. My mother was utterly mortified. They enclosed the front screened in porch with plywood painted white, turned the dining and music rooms into viewing parlors (the large window grouping on both sides of the house) and processed the remains in the kitchen and on that back porch. I would hope they installed a better water system. 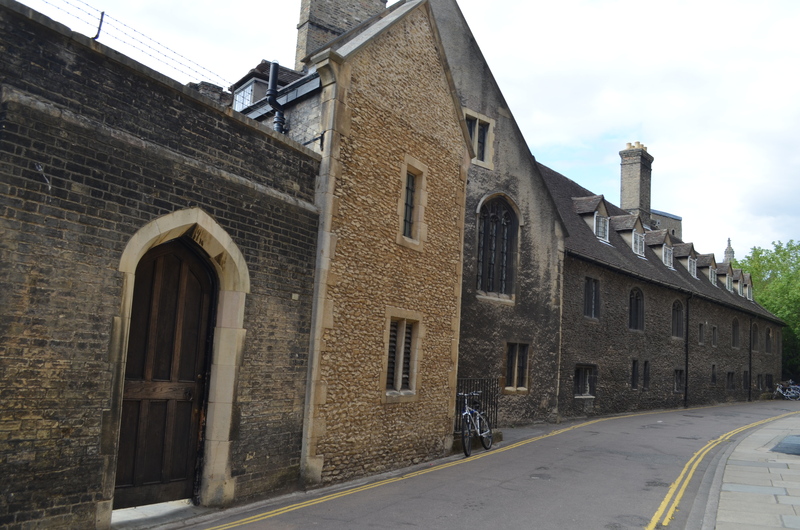 The garage, seen behind the house is where the hearse was kept and the bodies loaded, unloaded and well, um, stored. My mother, for years, when someone died in Silver Lake just prayed that the funeral was at the “other” funeral home. 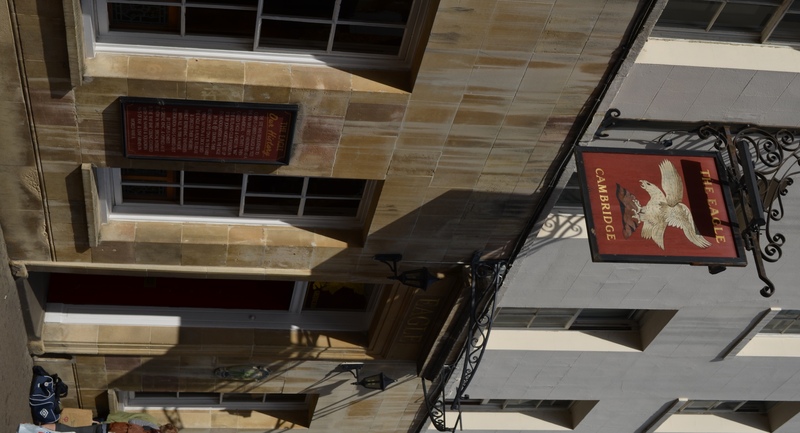 She was utterly mortified that her family home had become a funeral home, and she said she simply could not go inside. Finally though, someone died, and she had to find a way. That someone was Roscoe. 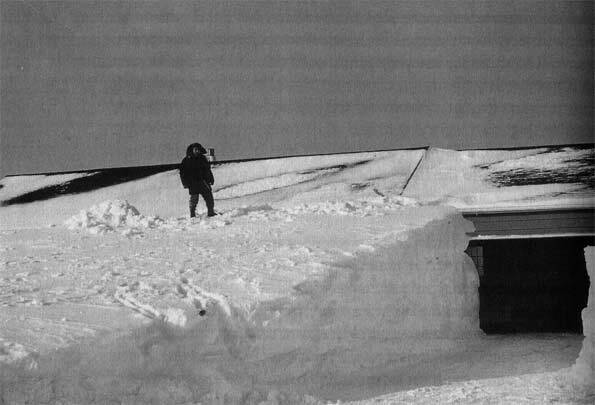 He died, as luck would have it, 36 years ago this week, on the morning of the epic blizzard in Indiana, January 25, 1978. And when I say epic, I mean epic. We have photos of family members on drifts level with the roof. These are just the kinds of things the Ferverda family did, especially these two brothers! Both John and Roscoe would have found that immensely humorous. Everyone else, not so much. The roads were closed, for days. Finally State Road 14 was opened, one way, through snow tunnels. 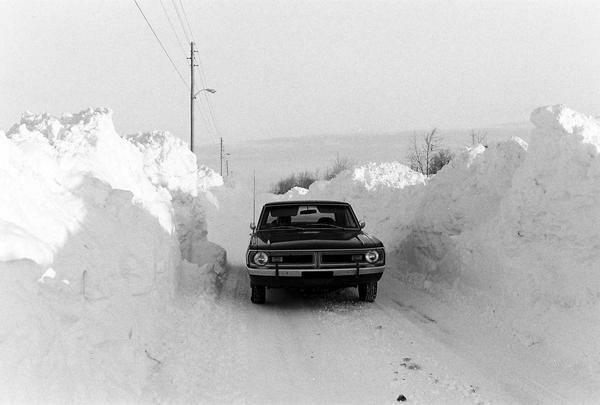 Roscoe’s funeral was held, such as it was, and then, because the snow was too deep and the ground too frozen for too far down…Roscoe got to spend the next several weeks in his brother, John’s, garage. John and Roscoe may be gone, but their DNA isn’t. Roscoe’s son provided his DNA, quite graciously, as part of a DNA presentation at the Allen County Public Library a few years ago for Y chromosome testing. Because of his generosity, we know that the Ferverda men fall into haplogroup I1, and their DNA is quite unusual. 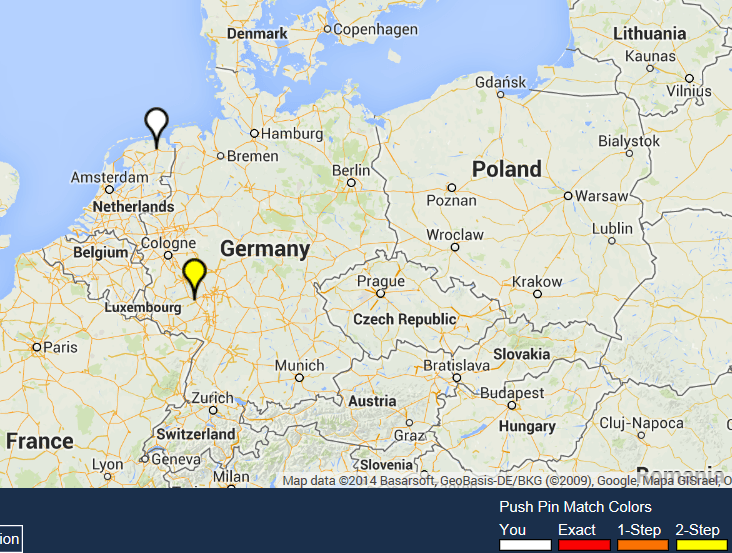 At 25 markers, only 2 matches, and one of those is a Scherp from Germany. We’ve tested several downstream SNPs as well, to see if we can refine his haplogroup further, but so far, he has tested negative for all of the SNPs tested. He is a member of the haplogroup I project, where the administrators have grouped him in the I1 generic group. Each project is grouped differently, according to the project goals and the administrators, but in this case, his grouping tells us that he does not match the other groups, such as “AS” for Anglo Saxon or “N” for Nordic, or Balkan or Iberian, for example. 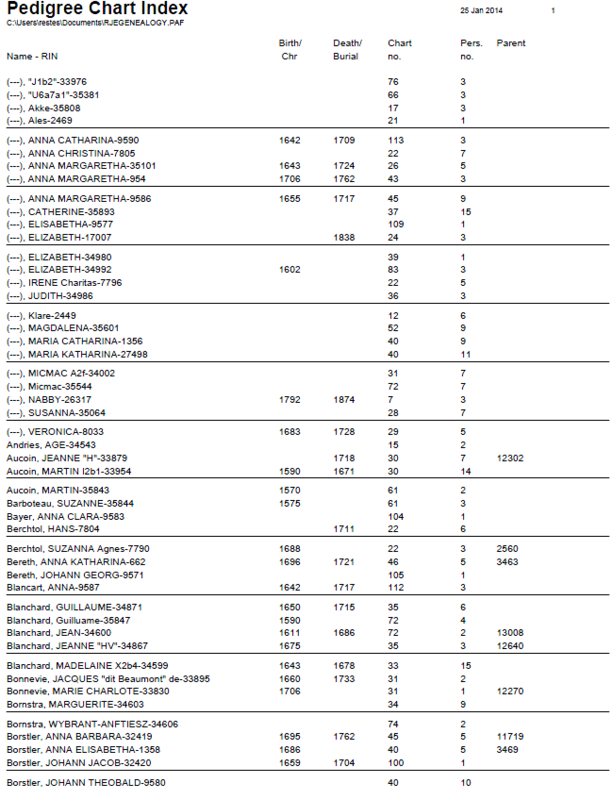 For as unusual as his markers are in the second testing panel, at 25 markers, providing only 2 matches, his 12 marker matches are extremely common in haplogroup I, providing him with 1028 matches. His 12 marker matches are shown on the map below. Clearly these 12 marker matches don’t hold at 25 markers, and most of these people did test at 25 markers. This is the best example I can think of as to why testing at higher levels is so important. We’re having a virtual funeral….and you’re invited. 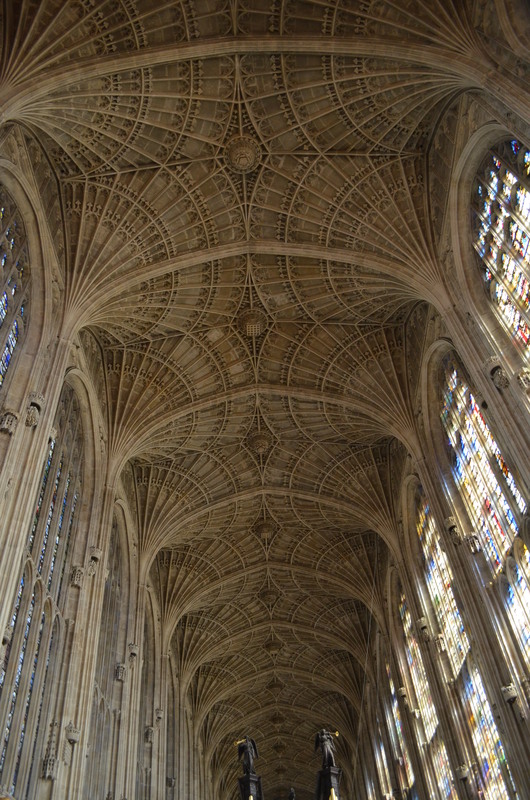 In fact, this might be a first….the first virtual funeral ever – and you can be part of this groundbreaking event. It’s a testament to how the electronic, internet, Facebook, DNA age has changed our lives. Aleda passed away more than a week ago, on January 26th. Sometimes things don’t always go exactly as we would like, and suffice it to say, Aleda is being buried tomorrow, Friday, February 7, at 2:30, alone. Well, not entirely alone, the man who mowed her yard since he was a child, and his wife, will be there, and the backhoe operator, of course. 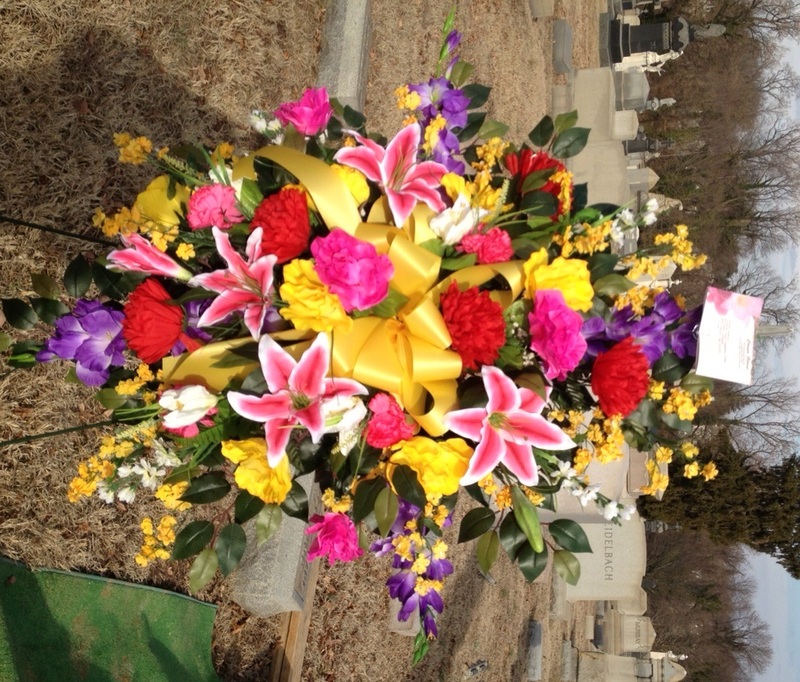 She has a world of online friends and cousins who she met through DNA testing, so, we’re giving Aleda a virtual funeral. 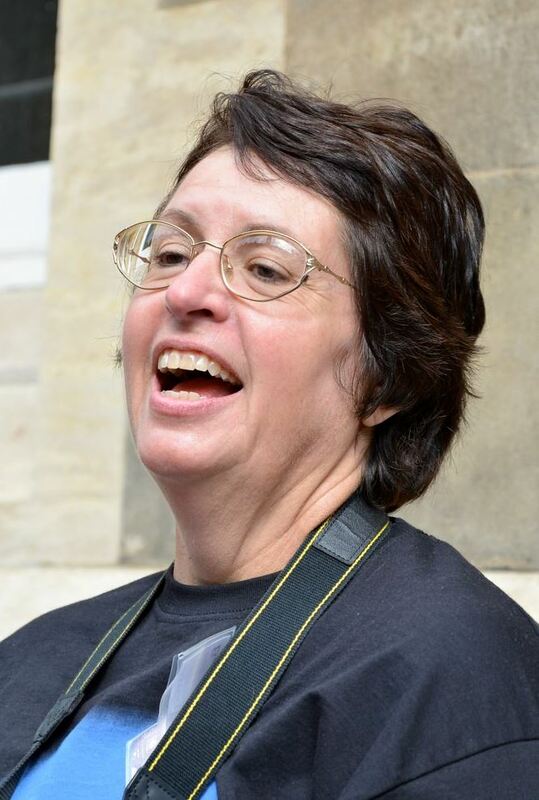 Her favorite reading was the 23rd Psalm, so we’re inviting everyone to participate at 2:30 by reading or reciting the 23rd Psalm, for Aleda, to lift her spirit to the Heavens. Let’s send her off with a chorus of voices. Aleda won’t be alone. We’ll all be sending her home. And that’s it. Nothing else for you to do, so it’s very easy to participate. By the way, I’m being a bit vague about her name and location because of her family’s concerns about the security of her property, which is why there has been no obituary, etc. Have you become close to someone met through traditional genealogy research. 42% – Yes, very close, like family. Have you become close to someone you met through DNA? 43% – Yes, somewhat close, we’re friends. 16% – Yes, very close, like family. 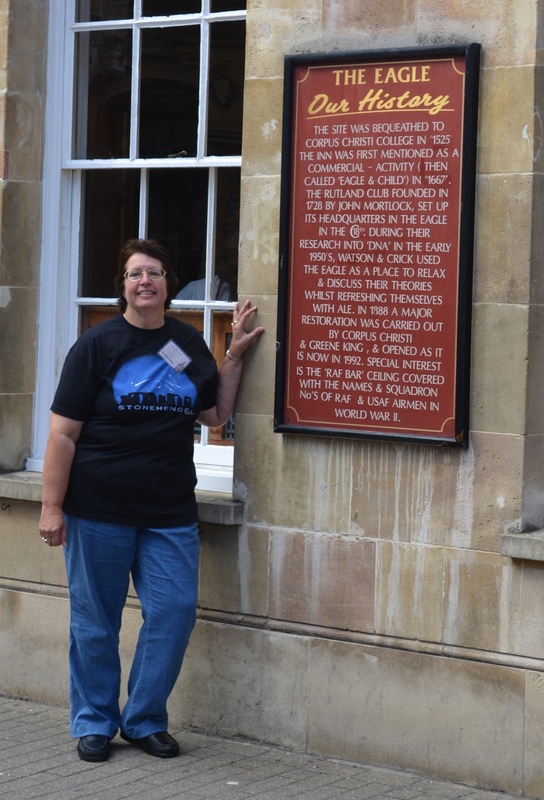 Have you met in person the people you’ve discovered during genealogy of DNA research? 14% – No, but have plans to. Well, I can tell you how Aleda answered those questions, and although the polls are anonymous, I’m sure she answered because she was the consummate contributor and participant. Aleda would have answered yes to all of the above. Aleda was a joiner. 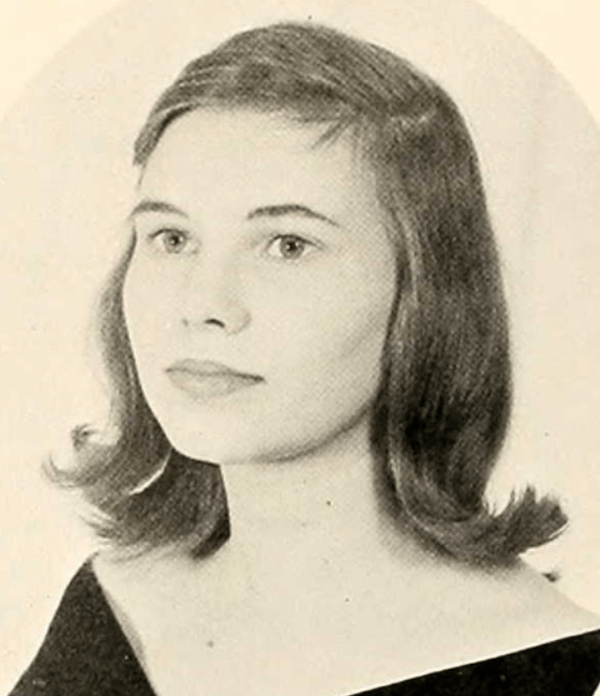 In High School, she was a member of several clubs, the editor of the newspaper, and she loved science, especially chemistry. It’s no surprise then, how quickly she embraced DNA testing decades later when it became available as a genealogy tool. She was a pioneer, one of the first. 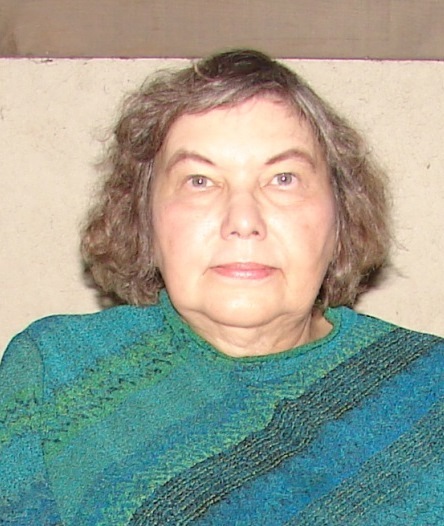 Aleda became interested in genealogy early in life and spent 50 years researching her family history. She became active in the DAR as well and I believe was a 47 year member. 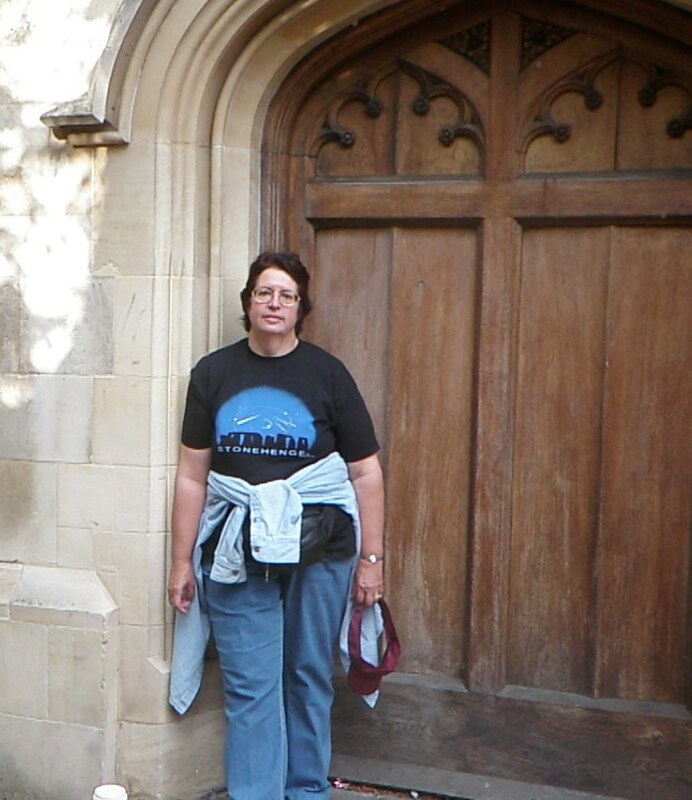 By the time I met Aleda, in 2006, congestive heart failure had already set in, but that didn’t slow her down much, and it certainly didn’t stop her. Aleda volunteered to help staff a table for the Lost Colony Research Group in Manteo, NC. She had to walk slowly, due to the oppressive heat and her health, but walk she did, and she stayed with us all day, talking to people interested in the Lost Colony – or more particular, in figuring out if they descend from Lost Colony survivors. She was a founding member of The Lost Colony Research Group. 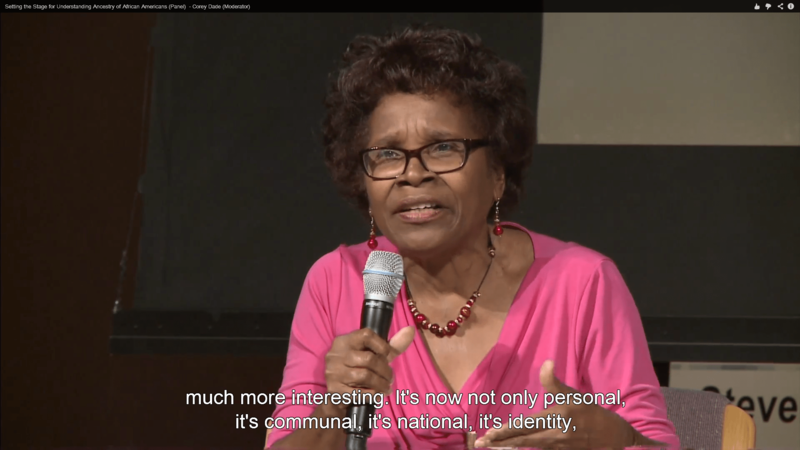 Her family, at least part of it, was from the South, the colonial South, the early South, the South that enslaved Indians and Africans, and she was descended from some combination of all of those people. Aleda’s DNA, you see, held secrets that would only be divulged when her brother took his first DNA test. To say Aleda was shocked is an understatement. But she was also thrilled. The bad news – it would be 5 long years before her brother would have a DNA match. Five years is a very long time to wait. But Aleda didn’t just wait, and she never, once, complained. Instead, she recruited people. She researched, she found other people she thought might be related. She told them of their wonderfully interesting and colorful family history. And she and her brother took every test they could take. Aleda was determined to learn everything she could learn by embracing this new technology. Her brother’s Y DNA is very distinctive. When he has a match, there is no question that it’s a match. Aleda gathered her brother’s matches into a research group. When autosomal DNA became available, she was one of the first to embrace that technology as well, and autosomal matches opened up a whole new world of cousins for Aleda. As her health deteriorated, it seemed that she worked harder and harder, and began teaching others what she knew. She had apprentices and taught her research group about file organization, about computers, about DNA and how to research. She knew her time was limited. She had come to love them all. She embraced all things new. 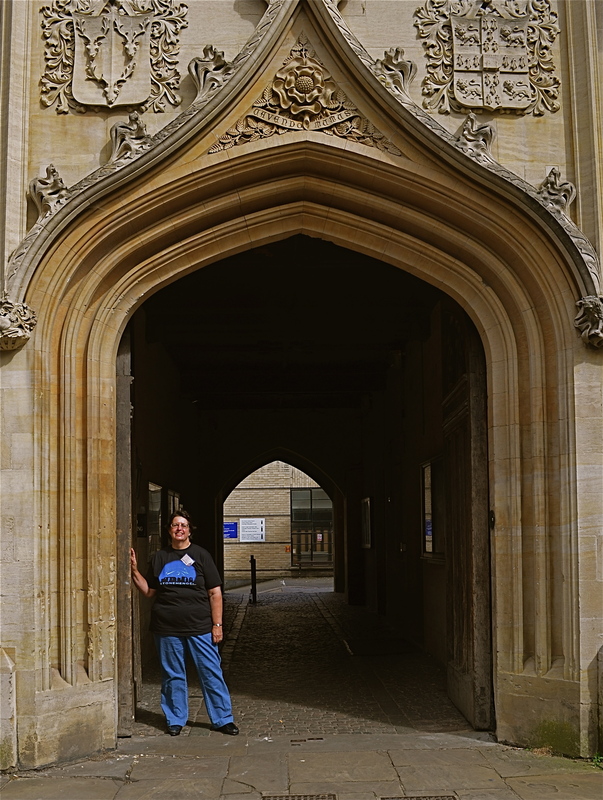 Aleda never had children, but she was a born teacher with a Master’s Degree in Education as well as a second Masters in Liberal Arts from John Hopkins. It’s no wonder that she always thought innovatively, outside of the box. Her research group told me that when my blog articles were published, they had to hurry and read them right away, because Aleda would be calling shortly to discuss how to apply them to their research. They told me how much Aleda looked forward to my blogs. I never knew. As Aleda became increasingly homebound, especially following a stroke a couple years ago, her world became her online friends and cousins with whom she communicated daily. 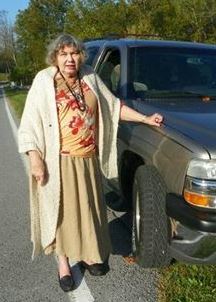 Her last trip was in the fall of 2013, despite her health challenges, to visit Hancock County, Tennessee, tracking down those pesky ancestors. She never gave up…not until the last day….not even the last day. The morning of her death, she was working on X chromosome clusters, and teaching, always sharing her knowledge with her research group. Aleda loved her cousins. I don’t meant that lightly. She truly loved them. They became her family that she had never had. They spoke with her daily. She knew them better than anyone else, even if they were scattered to the winds across the US. Unfortunately, the fact that we are so scattered, and that we are having an epic winter combined with age and health issues makes attending her burial impossible for her research group. So, a virtual funeral it is. What would Aleda think of this virtual funeral? Aleda was not just a friend. We talked most days and usually had a few projects going at the same time. 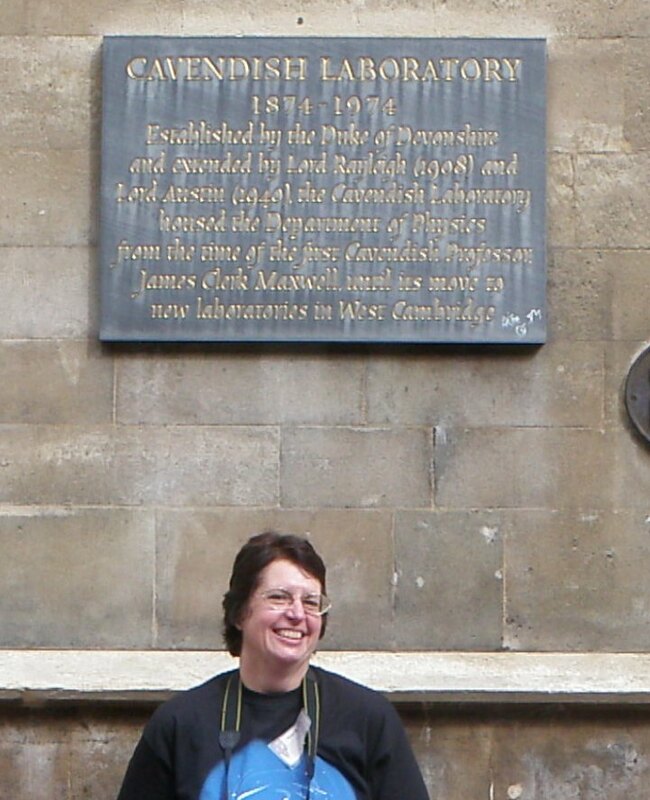 She taught my little group of kin what little we know about DNA – and much of it by following whatever Roberta happened to be doing on her blogs. She spent 50 years in searching for her ancestors and jumped in with both feet when DNA became available. She said you just couldn’t do enough DNA research. Because our brothers and my other male kin matched, we became Aleda’s project. Once I hopped on Aleda’s swiftly moving train, I didn’t get off again until her passing. She always had a project or two or three or more going at a time and was right in the middle of two big ones to do with the X Chromosome Charts. I think Aleda would love her virtual funeral, her “home-going,” and she would forgive us for not being able to attend in person because that’s how Aleda was. She always found the positive in everything and everyone. 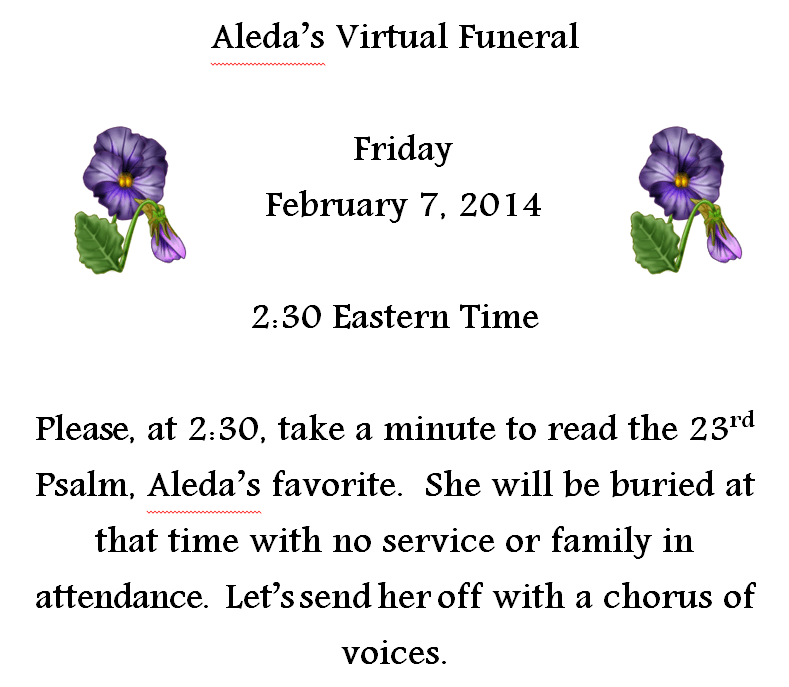 Please join us at 2:30 Eastern time on Friday to repeat the 23rd Psalm for Aleda. Please “like” this article if you’ll be virtually attending. 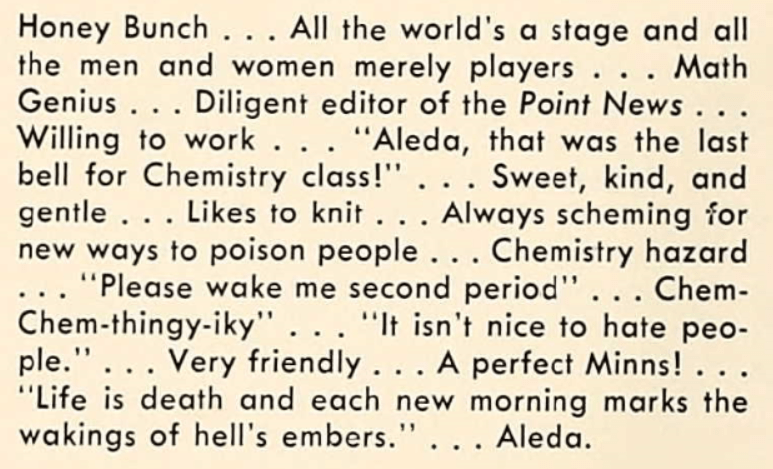 And then, let’s all be a little bit Aleda. 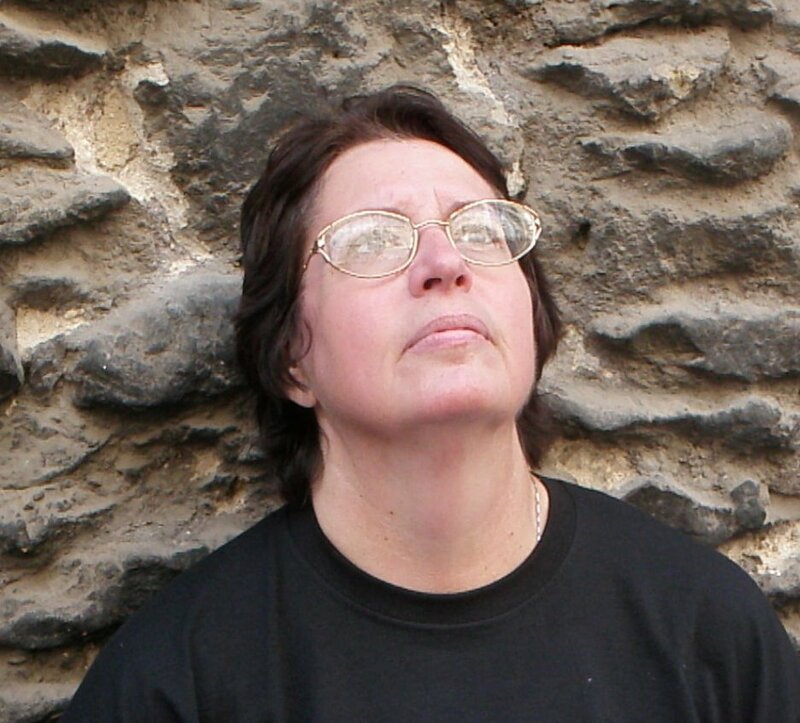 She made such a difference to so many who she reached out and touched through genetic genealogy. 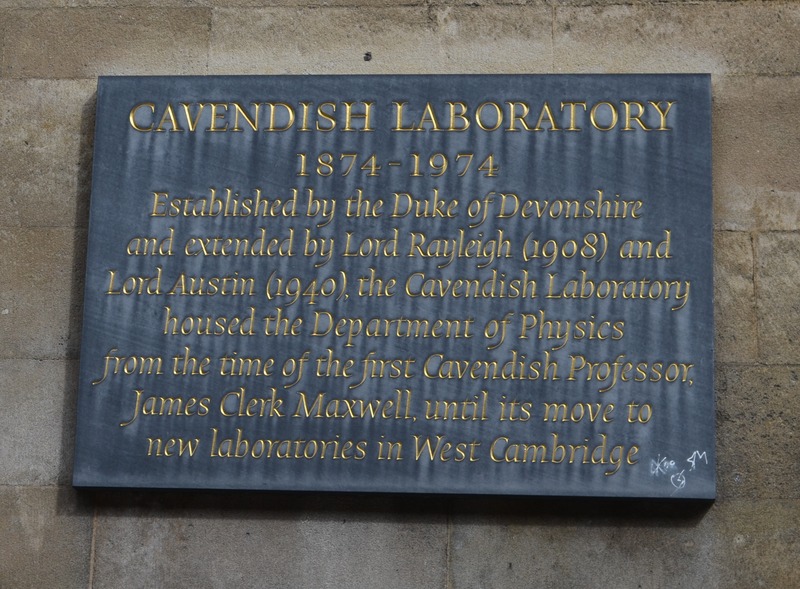 The science is simply a means to an end…and what matters in the end is family, however you come to define them. Aleda had a beautiful virtual funeral. Thank you to all of the virtual attendees for being your sister’s keeper. Lots of people participated by reading the 23rd Psalm. 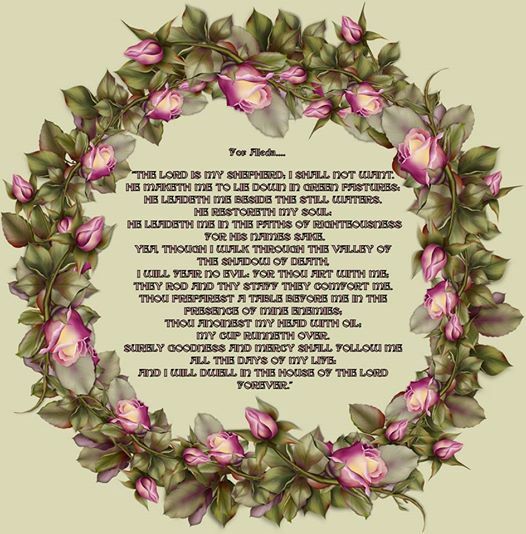 This beautiful version was created and contributed by Donna based on the rose wreath foundation created by www.jaguarwoman.com. 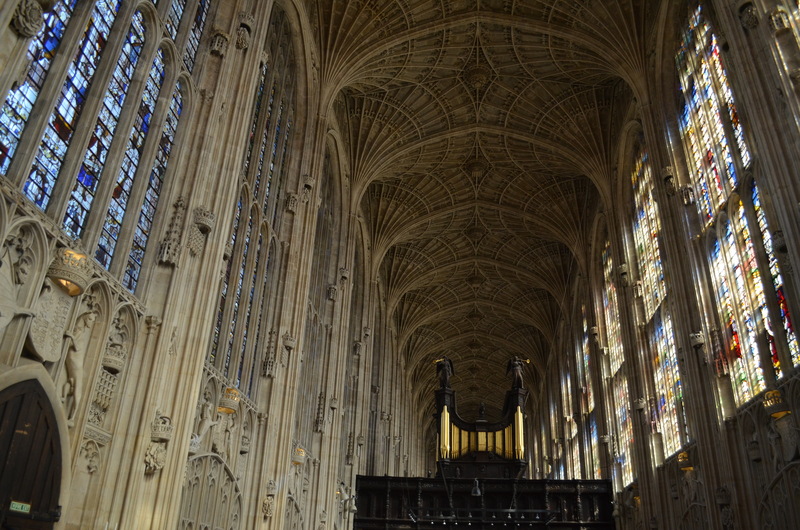 Aleda’s virtual funeral included a piano, trumpets, bells tolling, songs and Psalms. One gentleman in Texas played and sang this. A lady in Kentucky played the piano and sang. And in North Carolina, the reading was accompanied by this and bells tolling. 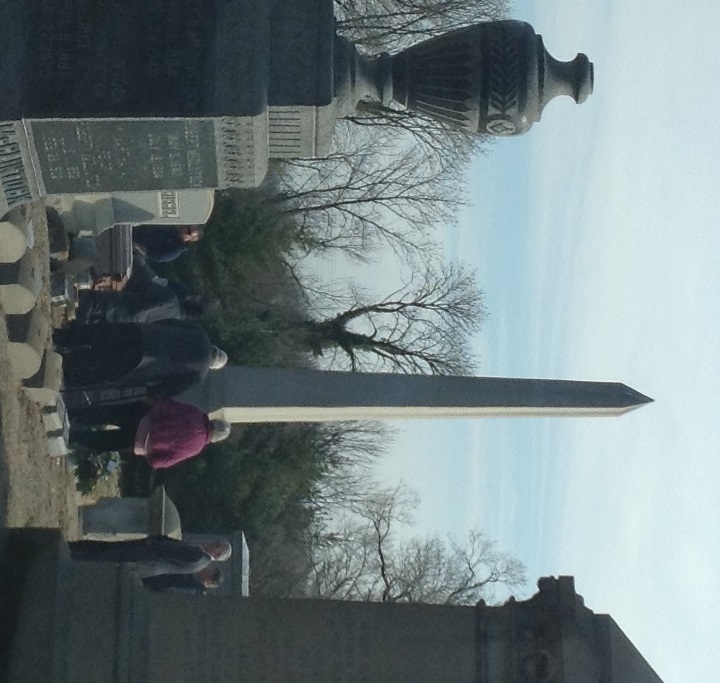 In West Virginia, a man took his heirloom family Bible and visited his family cemetery to read the 23rd Psalm. In Tennessee, a man visited the cemetery that held his 4 great and 5 of his great-great-grandparents, walking from grave to grave as he read the 23rd Psalm and the Lord’s Prayer. One woman was on an airplane, and several were attending the Rootstech conference in Utah and stole a few minutes away from the hustle and bustle. My husband was going to excuse himself from a meeting and go to the restroom, but instead, recruited his colleagues in the business meeting he was attending – and they all participated. Another woman, in Maryland, asked for and received a few minutes relief from her job on the “front desk” in a library. In fact, Aleda probably had more people at her virtual funeral than she would have been able to have in reality – when you consider the complications of distance and weather. The map below shows the locations of the people I’m aware of, and I know there were many more because the messages about her virtual funeral were shared over and over again. 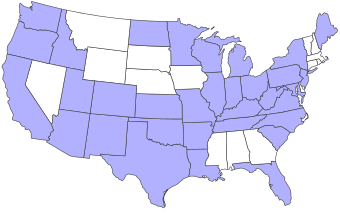 This map shows the states where people were who participated. In Kentucky and Tennessee, there were literally hundreds, followed by Texas. In addition, there were also several people from the UK, Japan, Israel, Finland and some of our military in Fort Apache, Afghanistan. It was an international event. Aleda would have been both surprised and pleased. I guess maybe this could be called the first virtual surprise “come as you are” funeral. I’ve been surprised by how many people have told me of special blessings they received while participating in Aleda’s funeral. 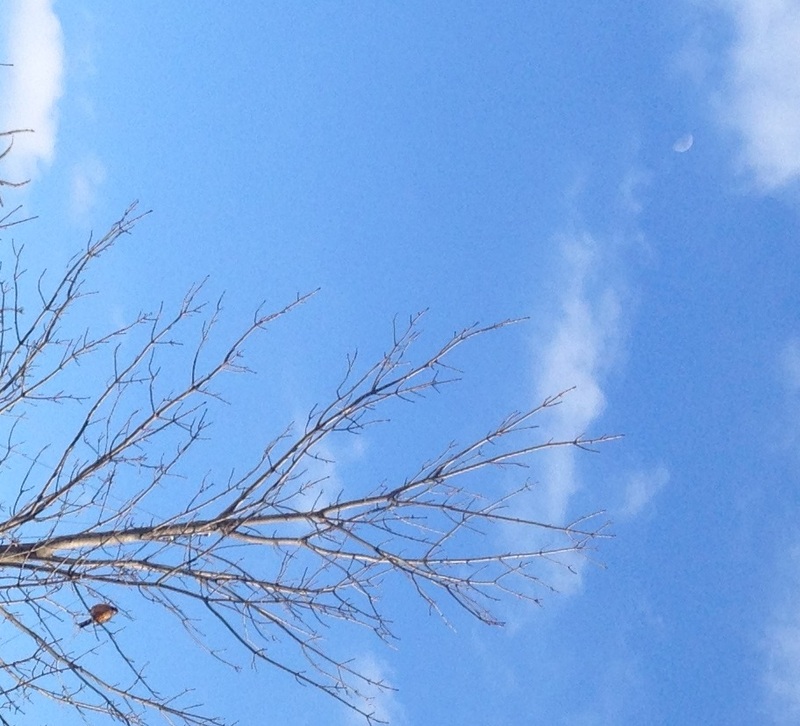 In my case, after I did the reading, outside in front of a huge drift in 8 degree, blustery, but sunny, weather, I realized that there was a half moon in the middle of the day, and the spring’s first robin had accompanied me. 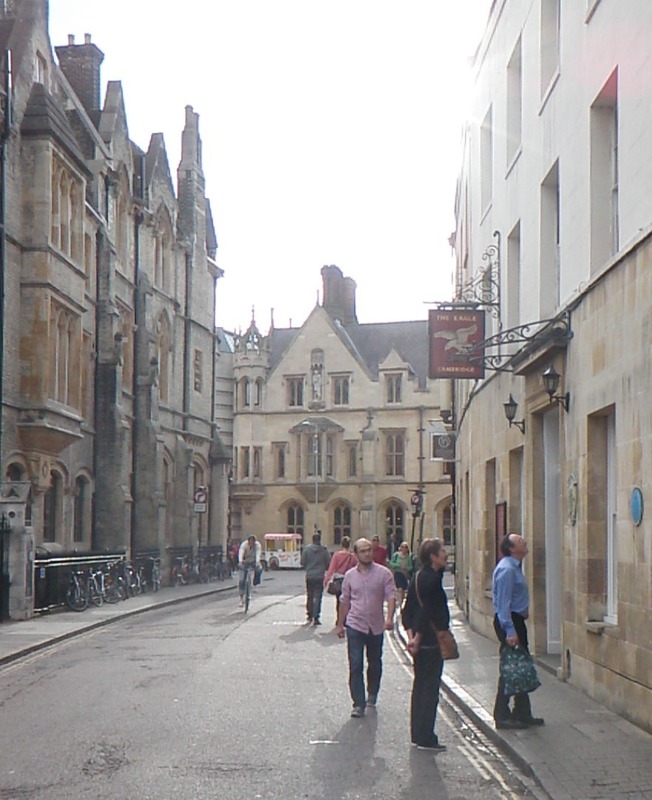 I’ve cropped the photo below to show both. Aleda also had flowers. 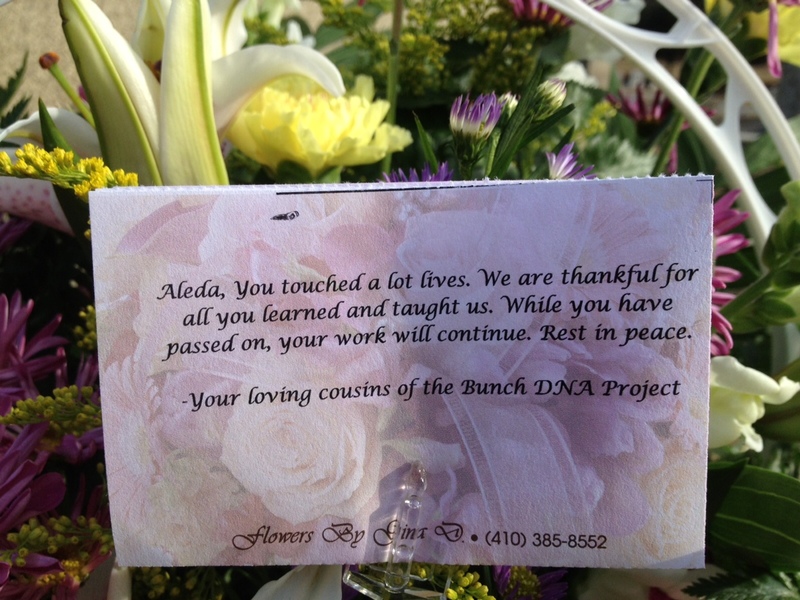 Three people sent arrangements with messages from the entire genealogy community. The florist’s husband attended the burial and took this photo for us, given that the florist had recently had knee surgery. He said that the funeral home that is adjacent to the cemetery learned of our virtual funeral for Aleda and some of the staff attended in person too, so there were 4 people, plus the florist’s husband and the workers who doubled as her pall-bearers who participated as well. Everyone read the 23rd Psalm aloud for her. One virtual participant added something to her reading, something that she felt Aleda wanted. Psalm 30:11 – You have turned my mourning into dancing for me, you have put off my sackcloth and girded me with gladness.